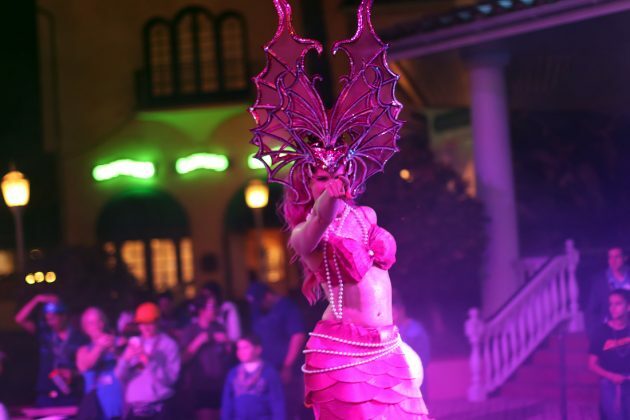 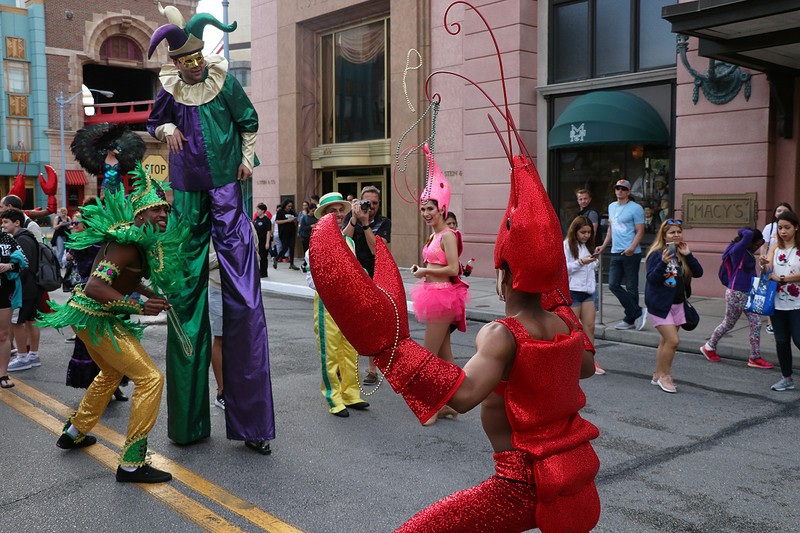 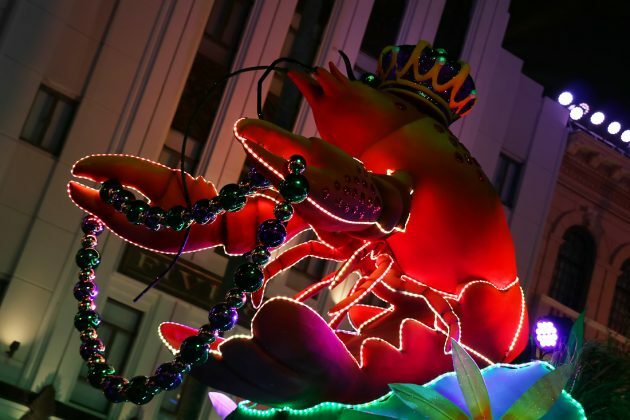 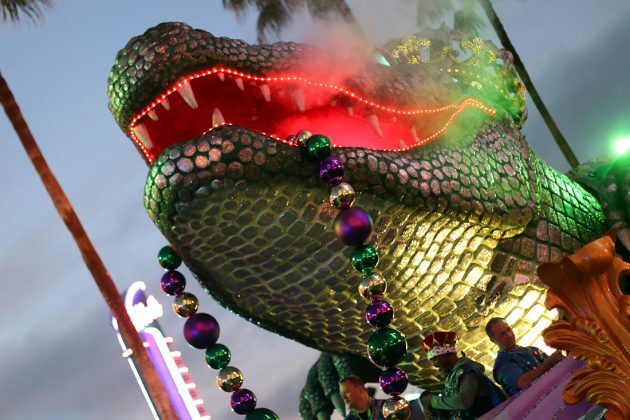 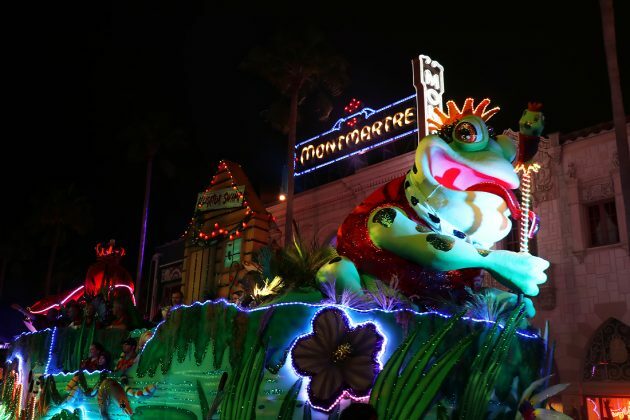 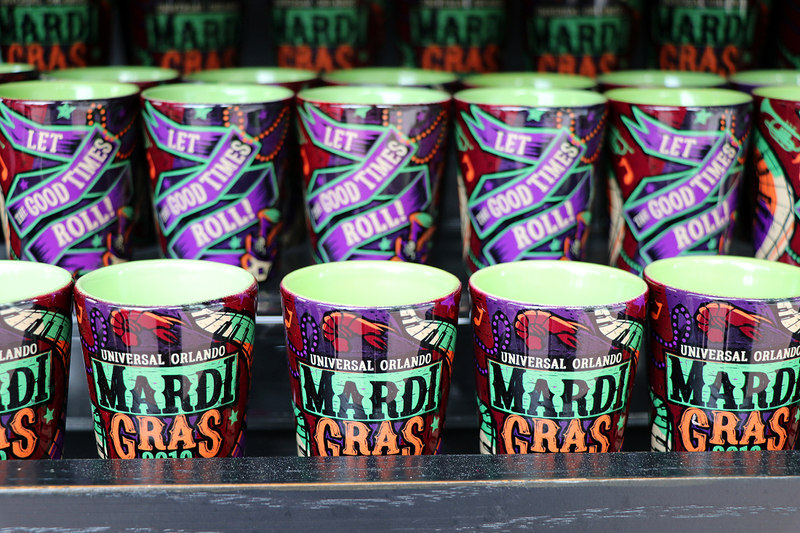 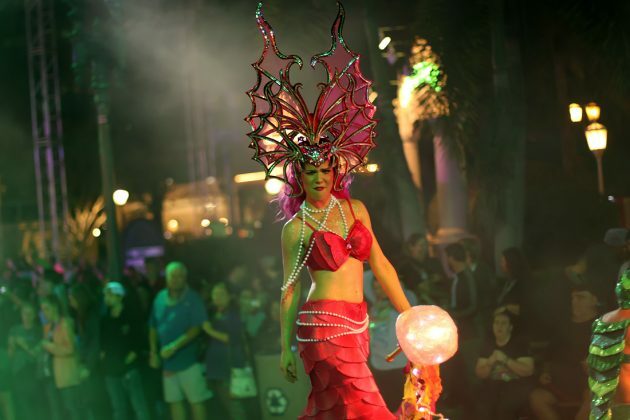 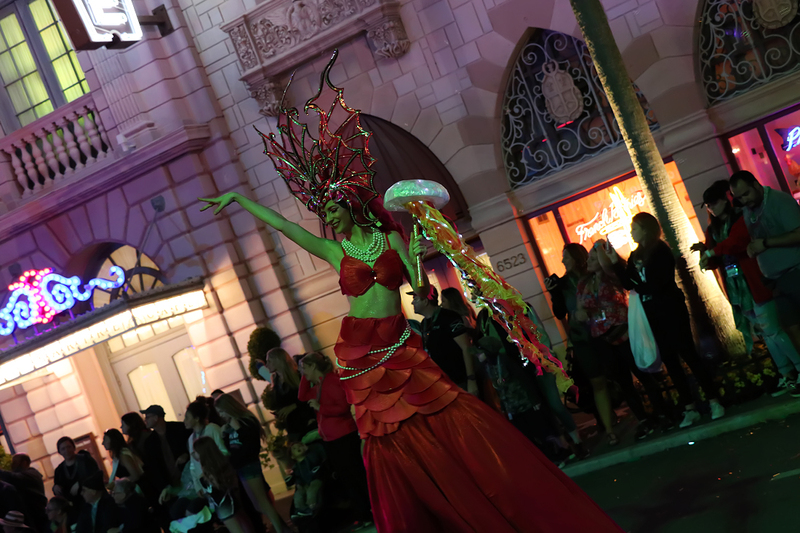 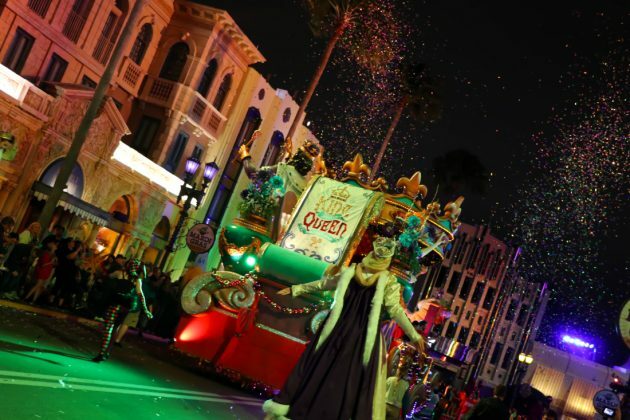 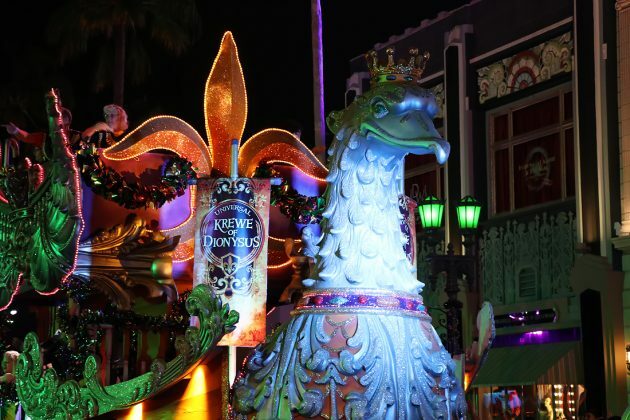 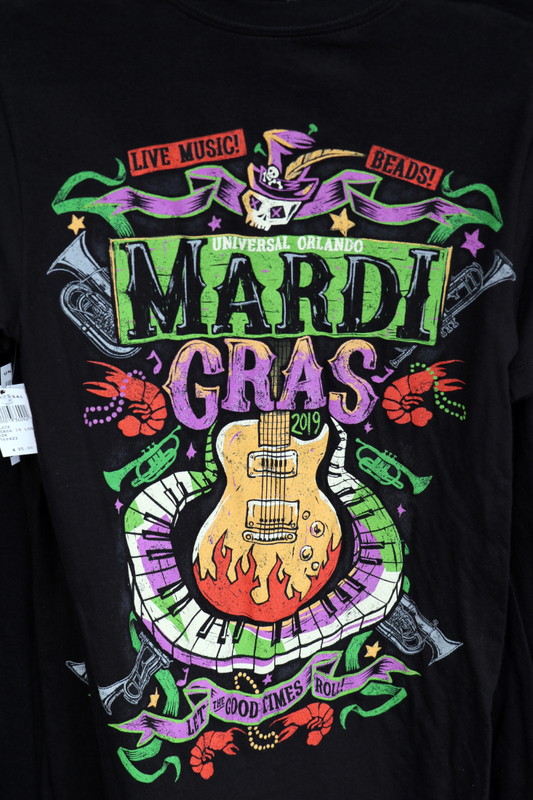 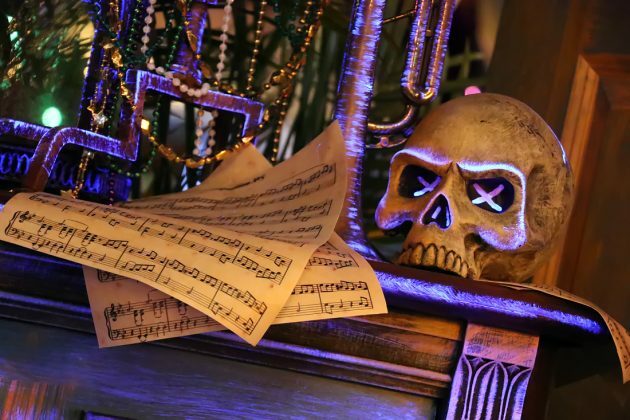 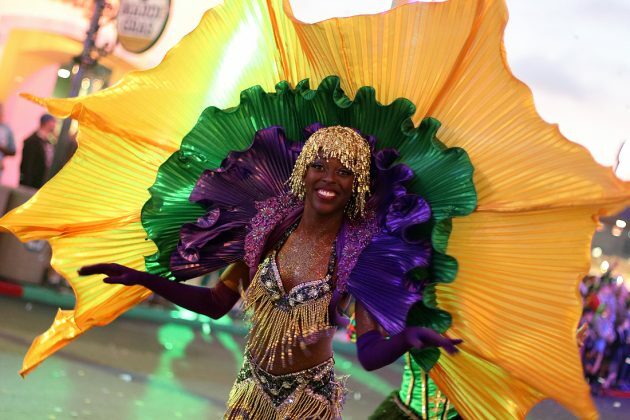 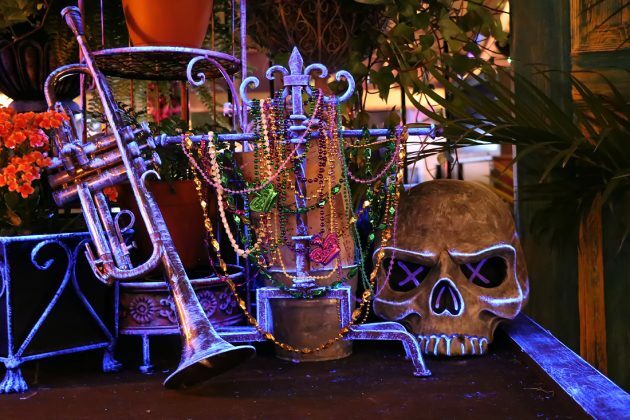 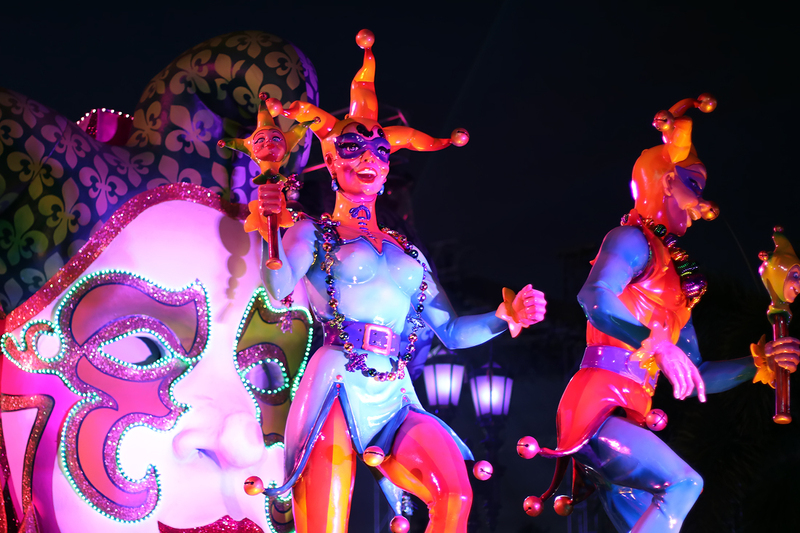 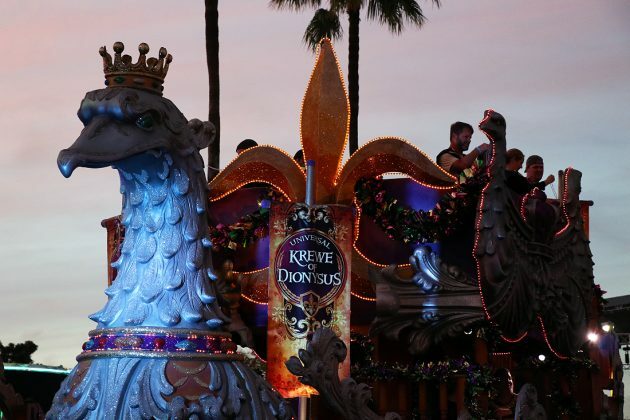 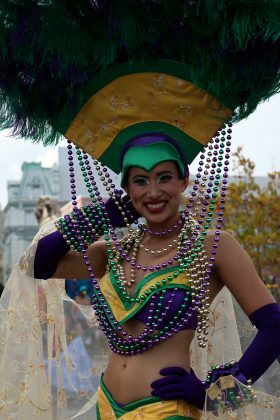 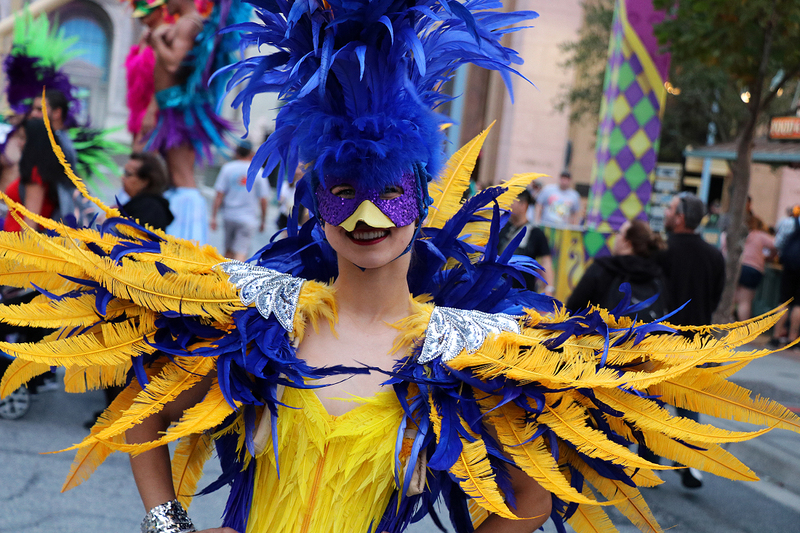 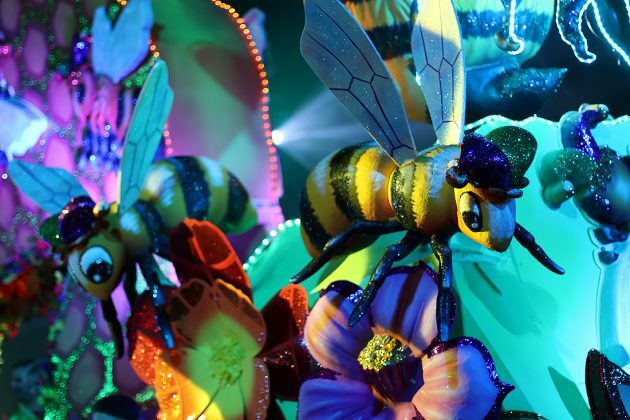 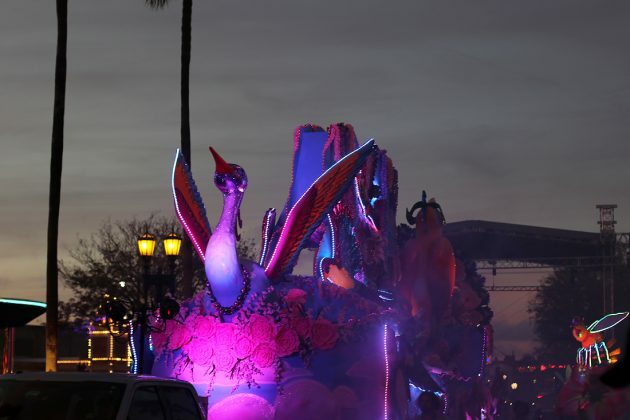 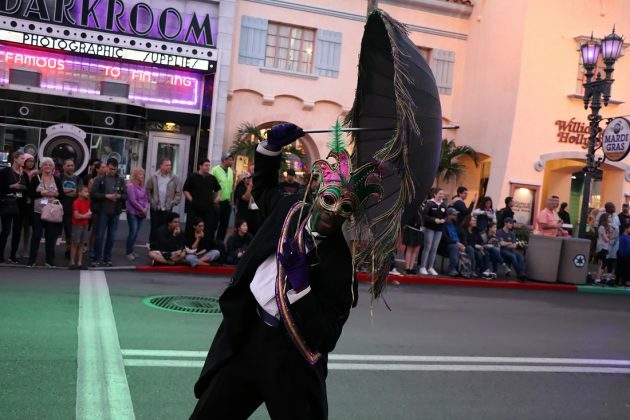 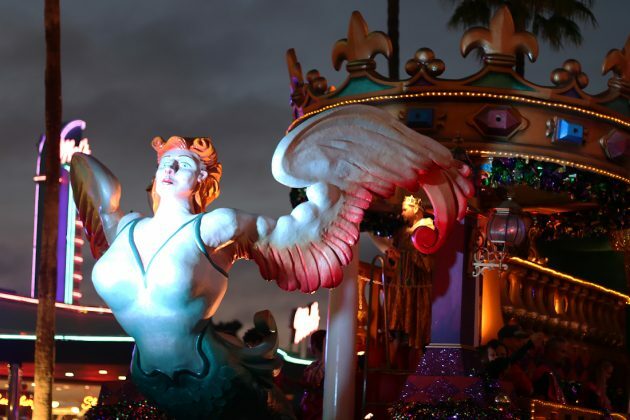 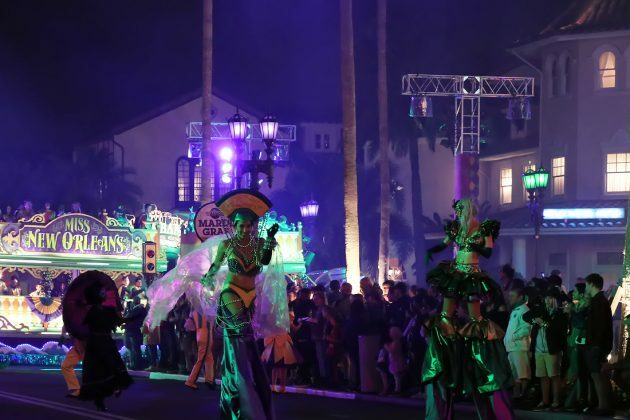 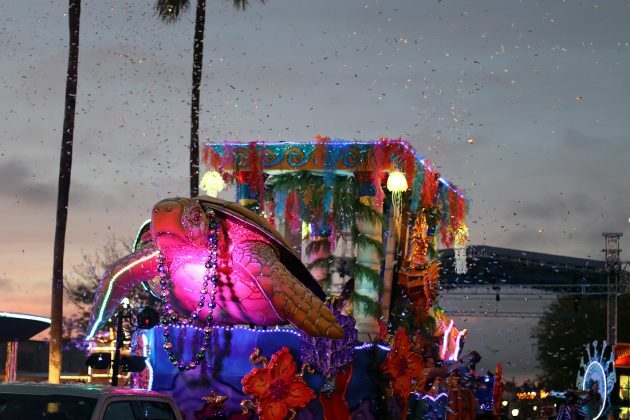 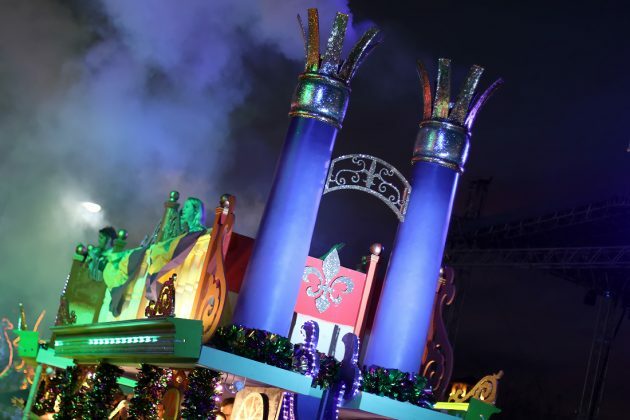 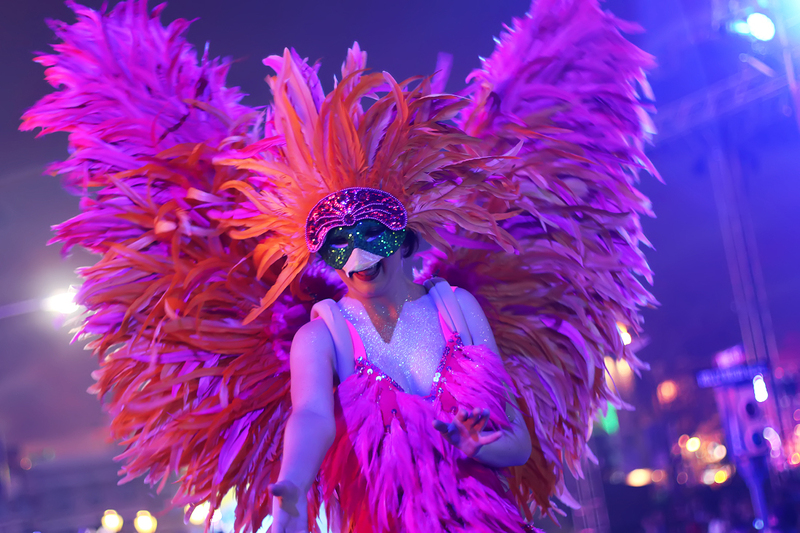 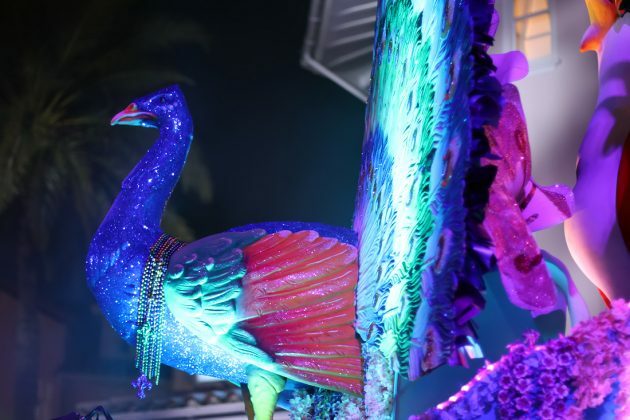 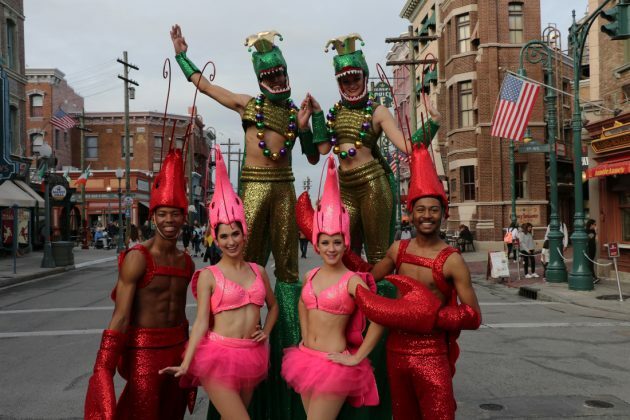 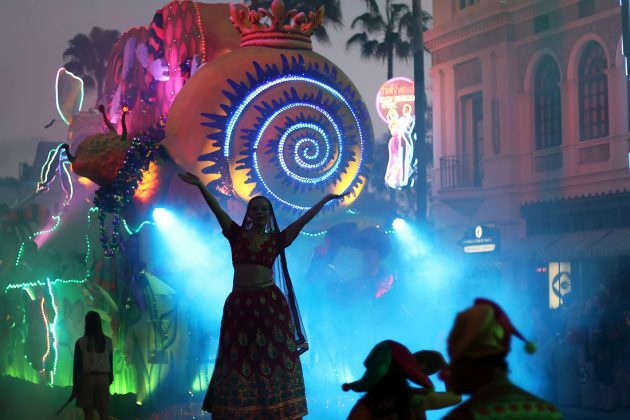 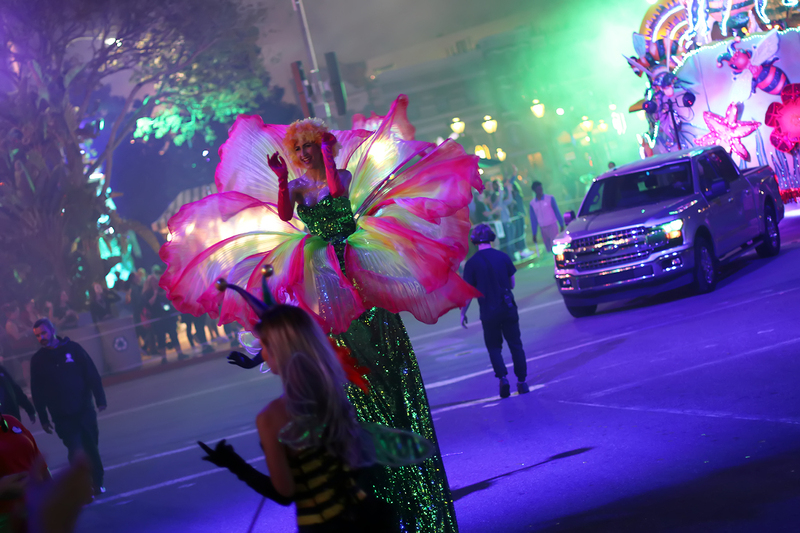 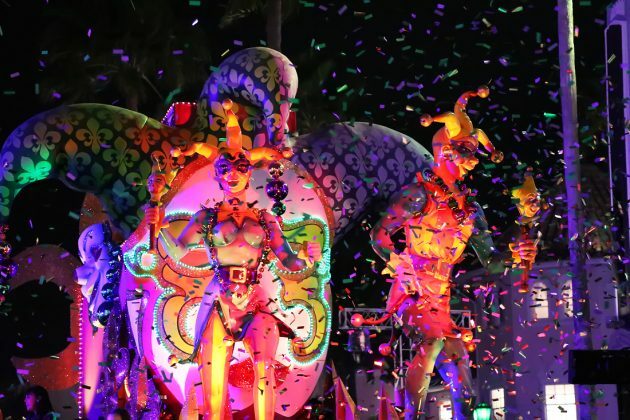 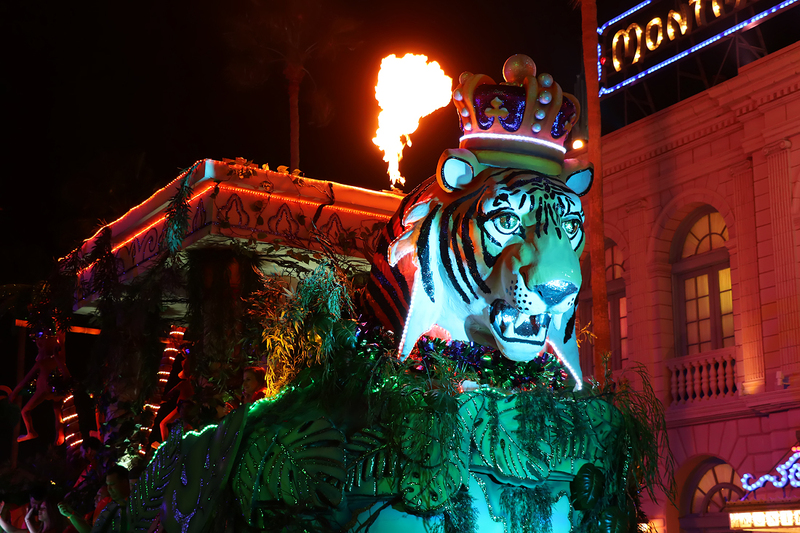 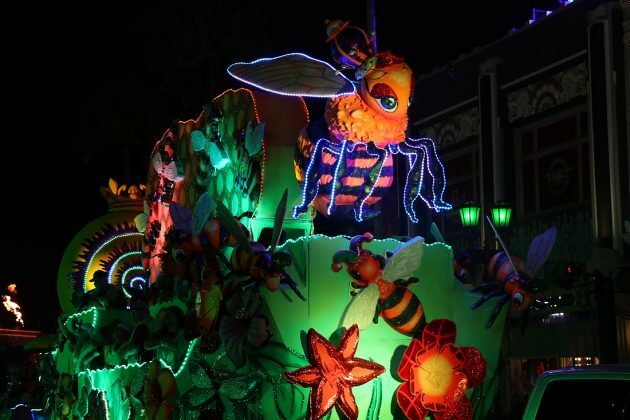 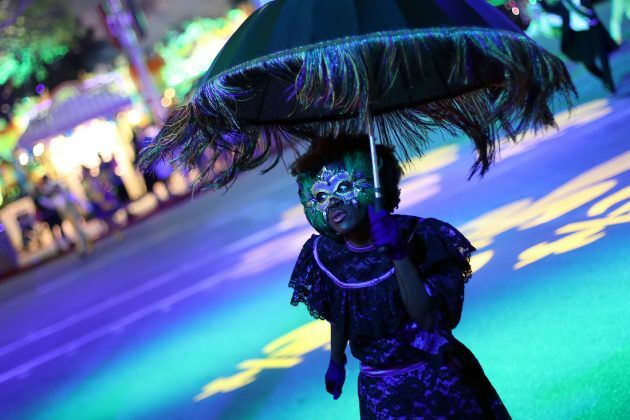 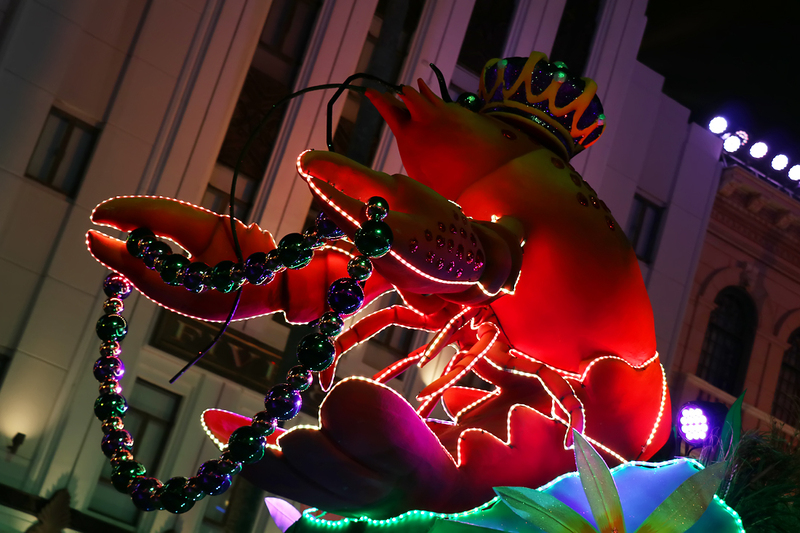 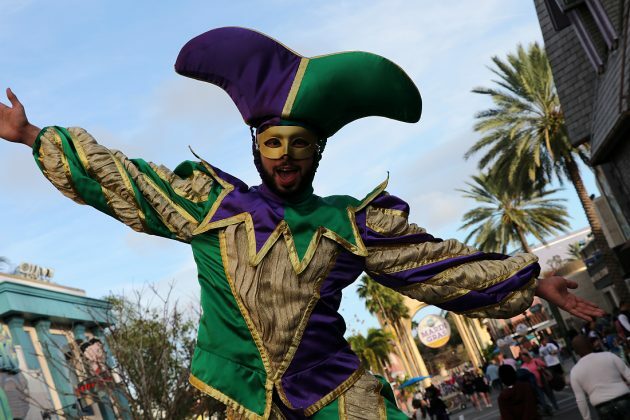 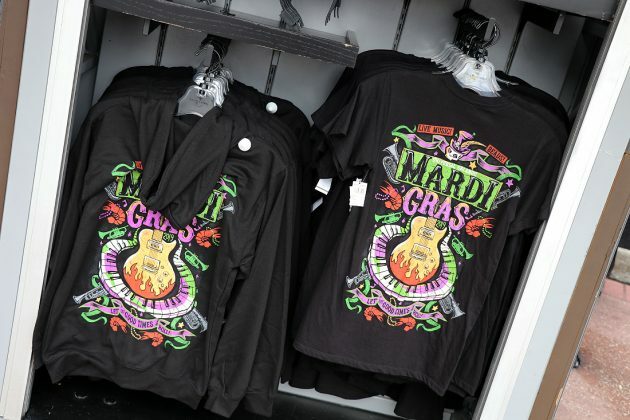 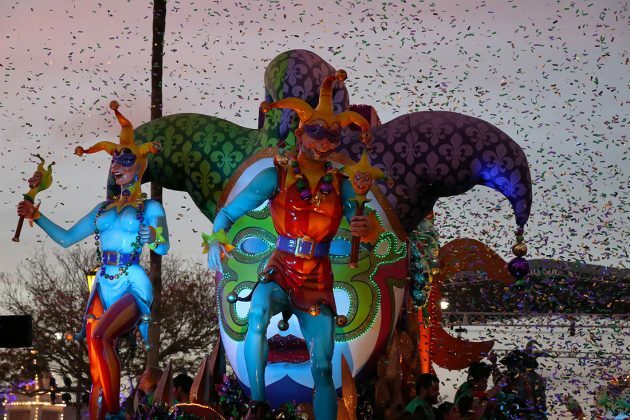 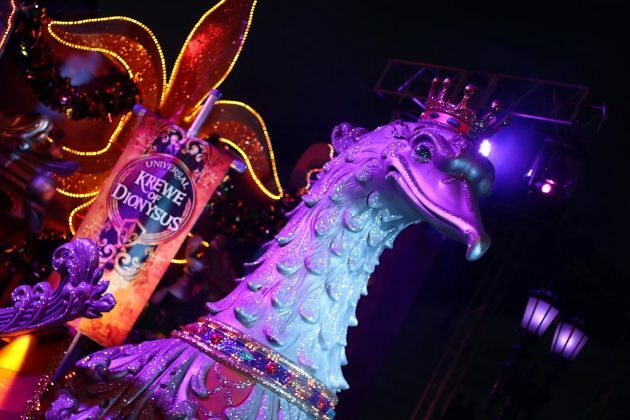 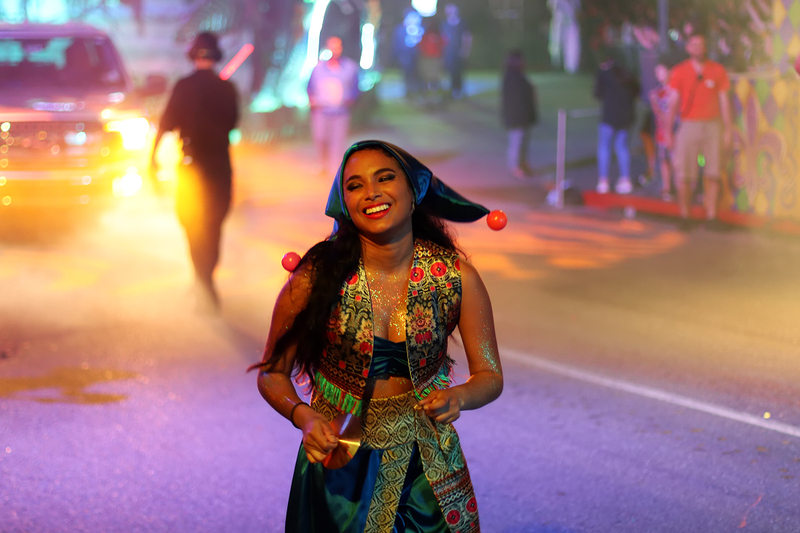 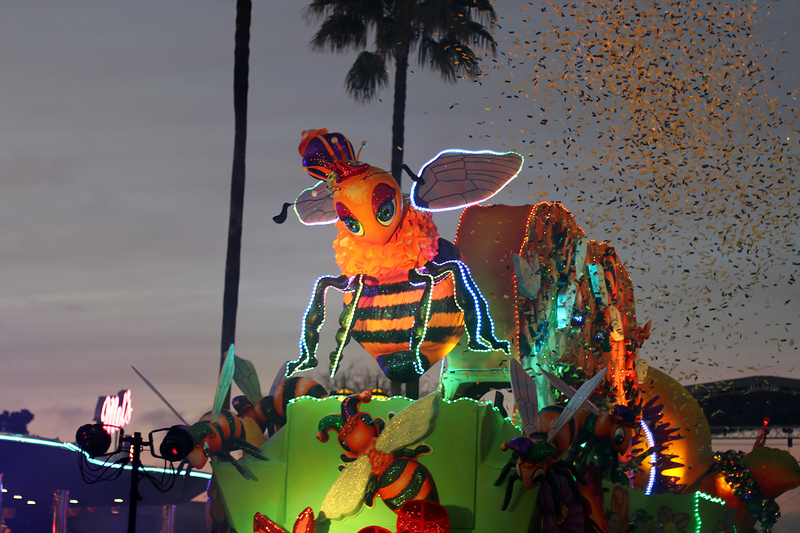 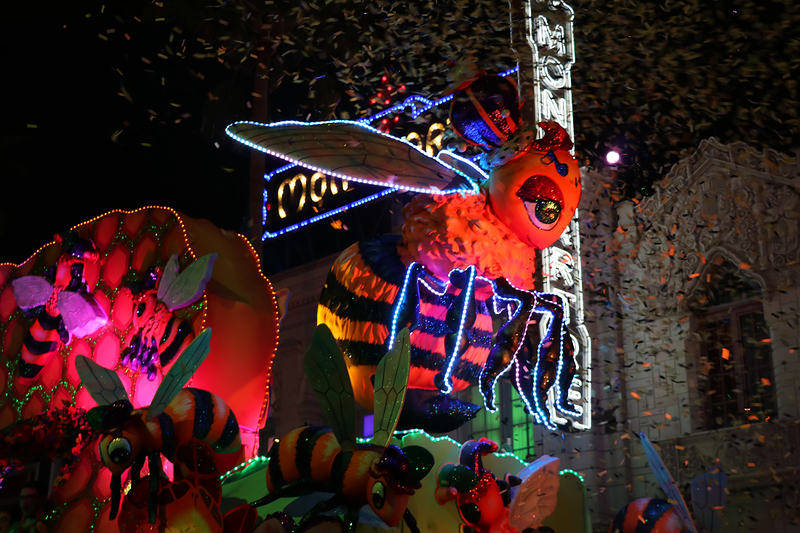 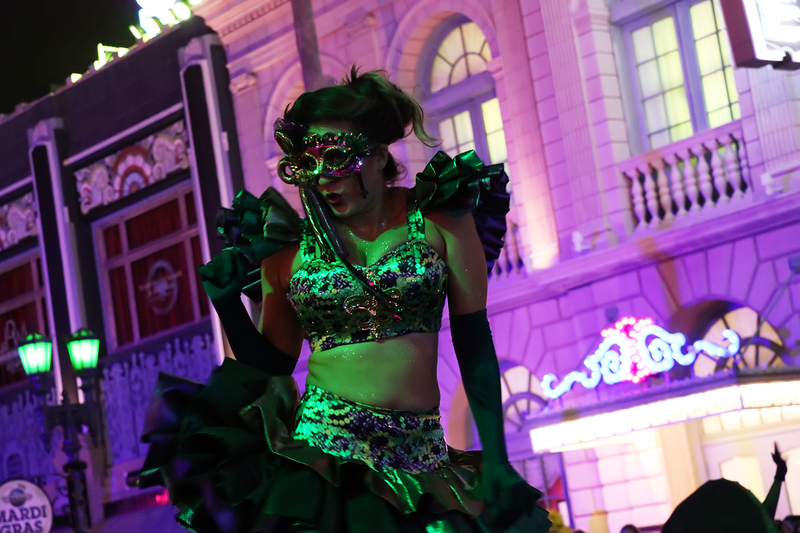 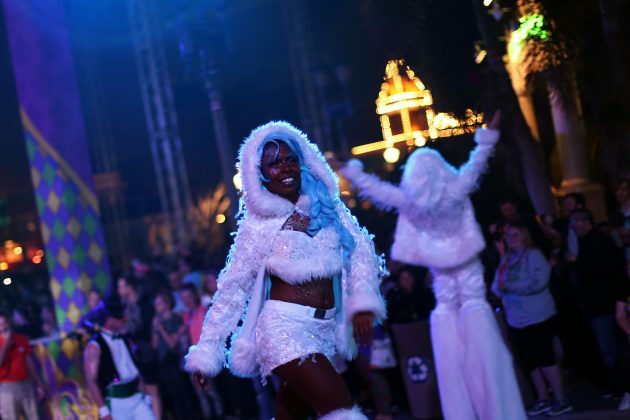 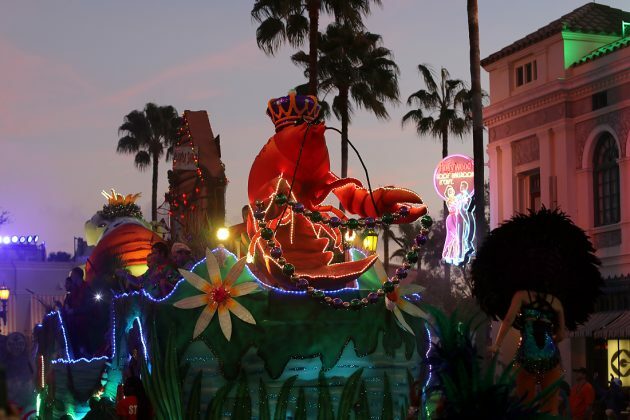 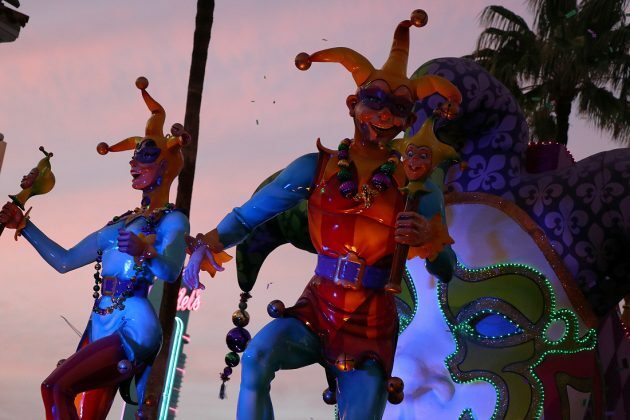 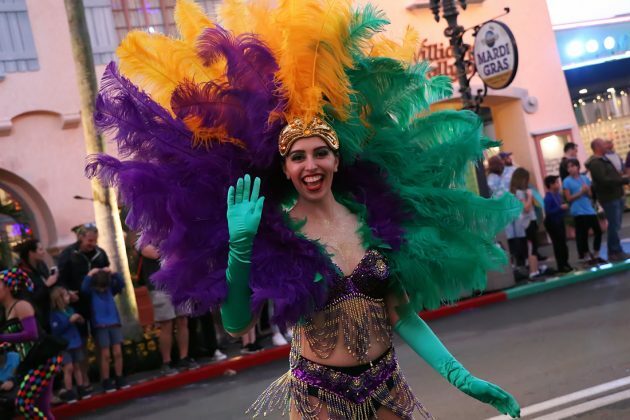 Mardi Gras is back at Universal Orlando, bringing the Big Easy celebration to Universal Studios Florida with concerts, parades, food and more. 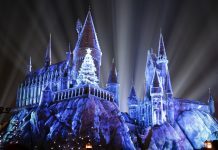 The event continues to be massively popular, and a great time to visit Universal. 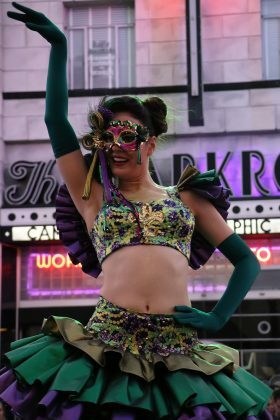 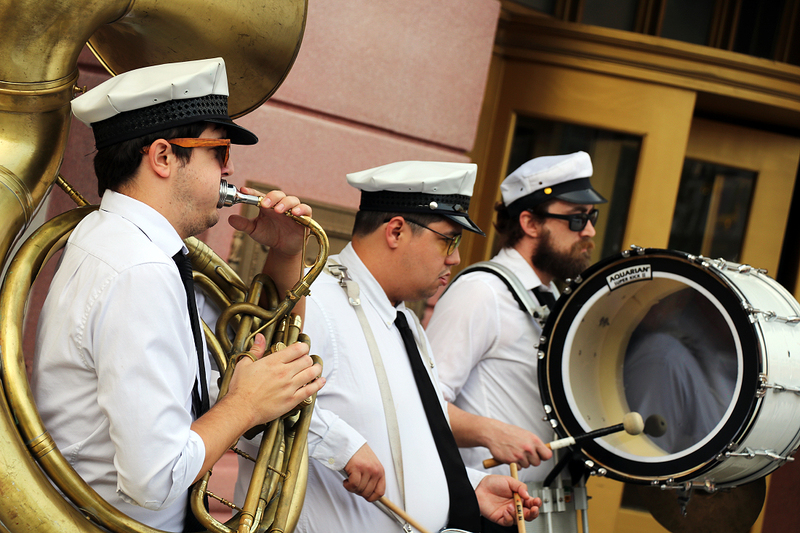 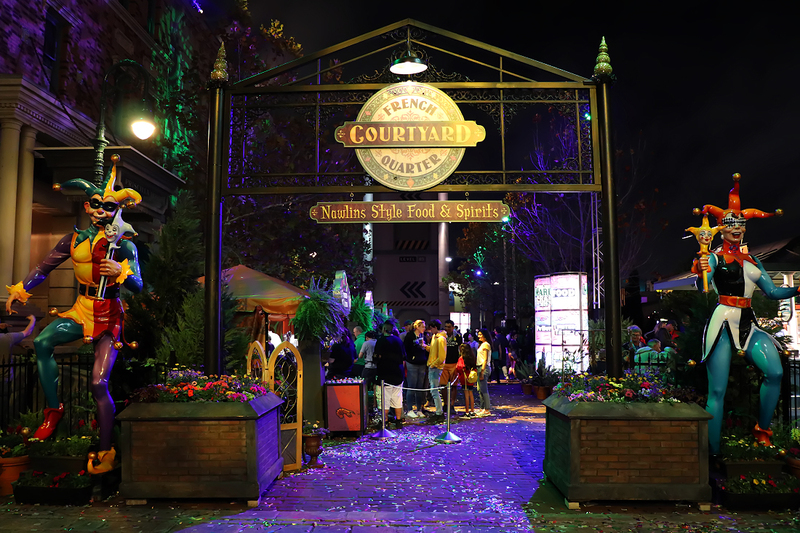 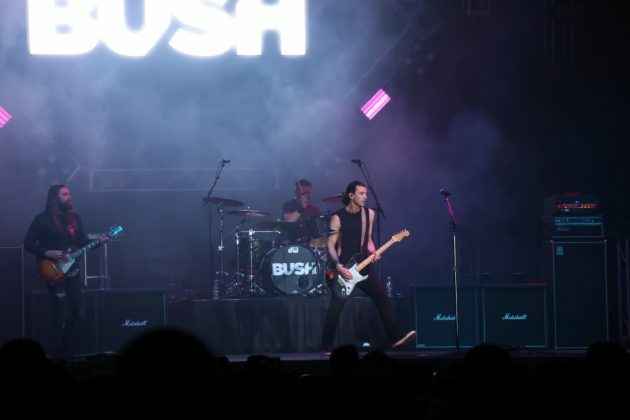 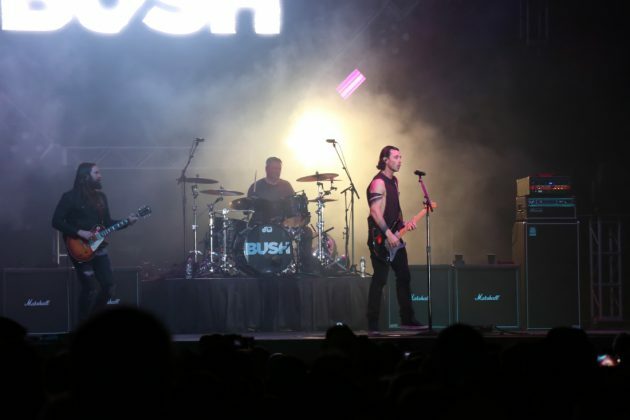 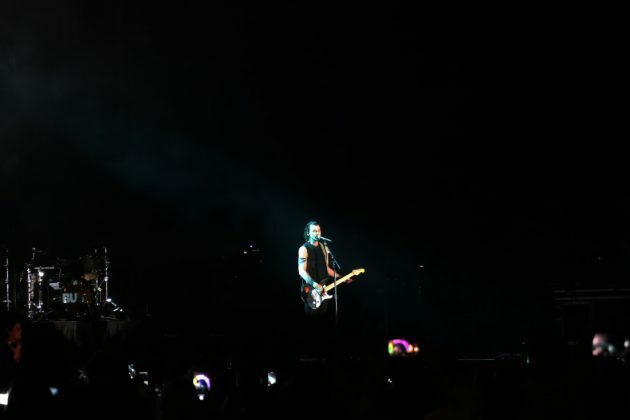 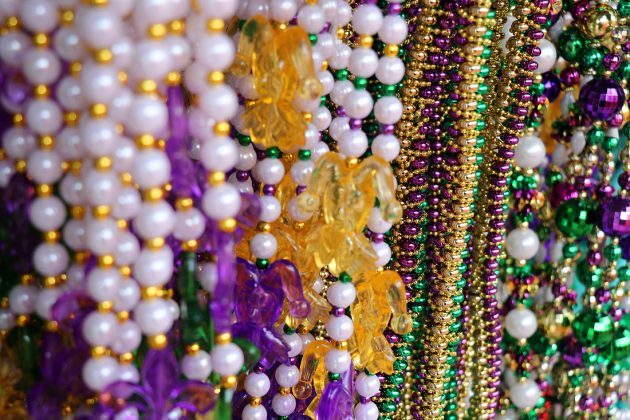 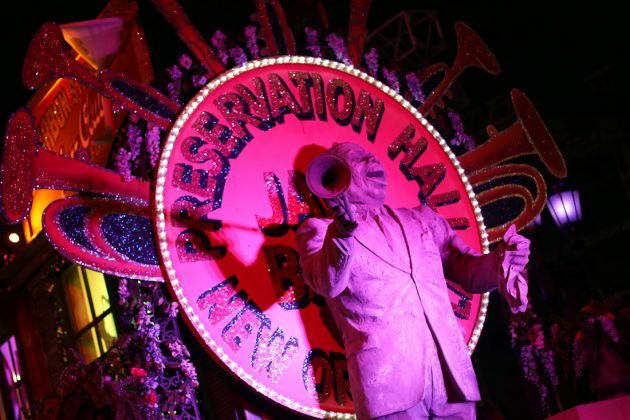 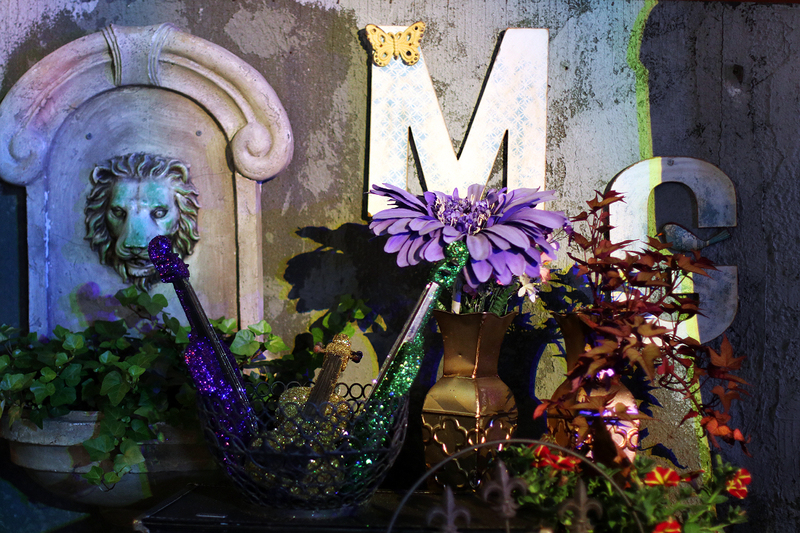 We continue to echo our thoughts of previous reviews: Mardi Gras is a must-do, especially if one of your favorite musical acts comes to town. As always, the parade is fantastic. 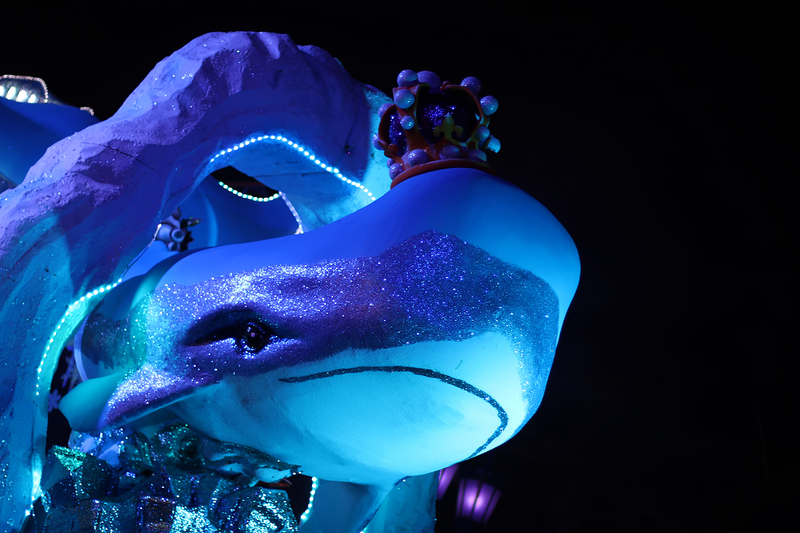 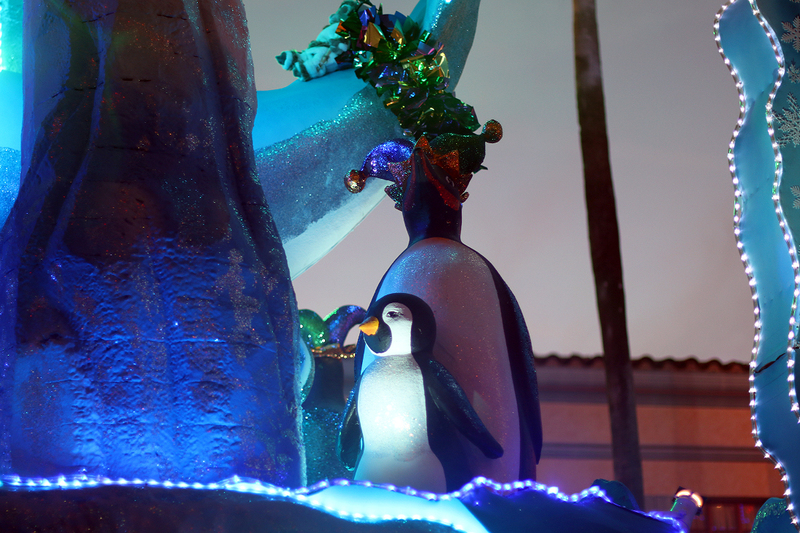 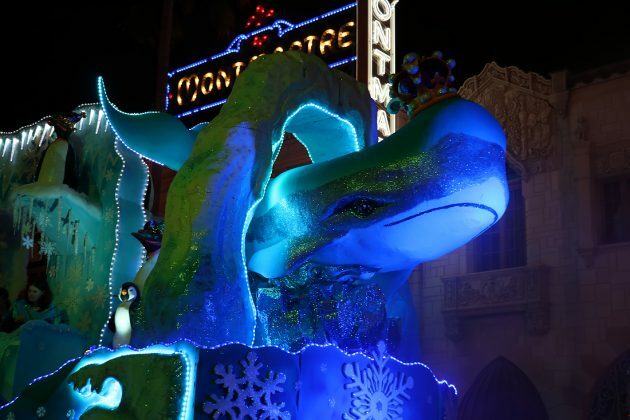 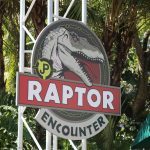 This year, Universal introduced 6 new parade floats that are themed to “party animals” – featuring animals from different biomes. 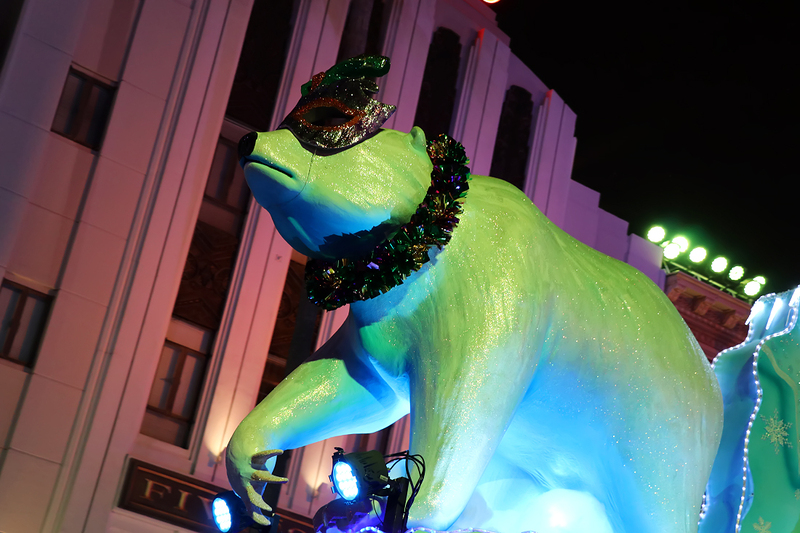 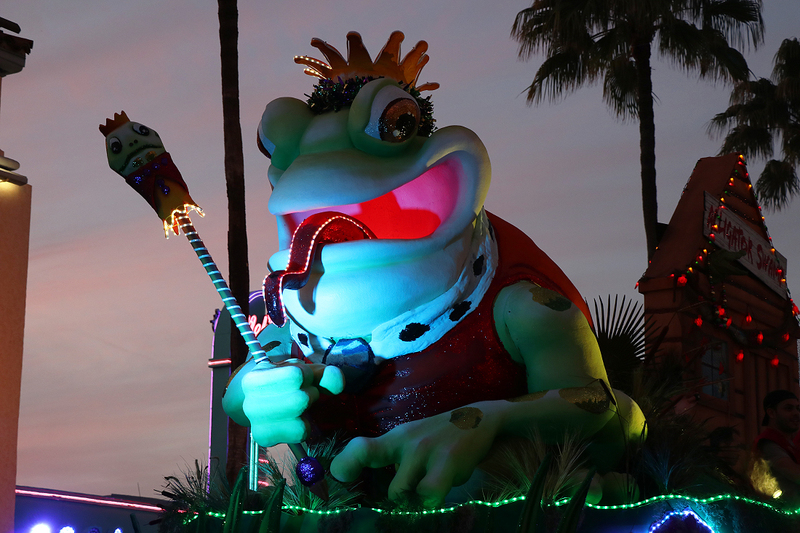 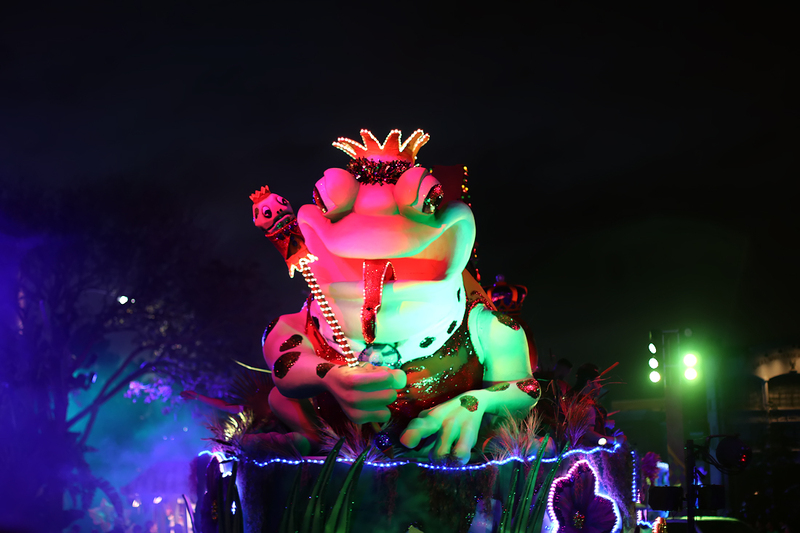 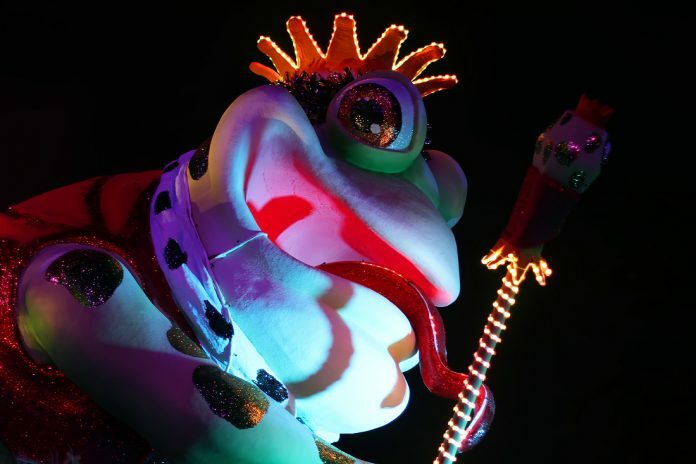 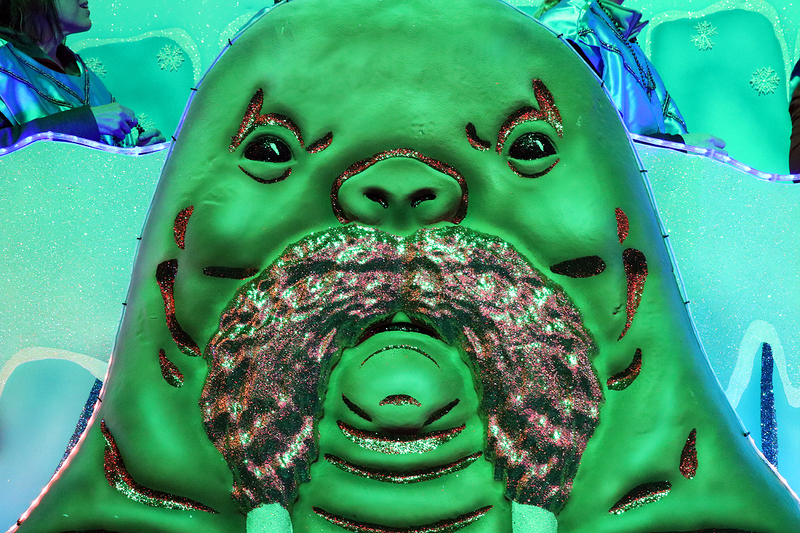 While each of them bring their own pizazz to the parade, we would be hard-pressed if we did not give all the love to the rightful king – The Frog King! 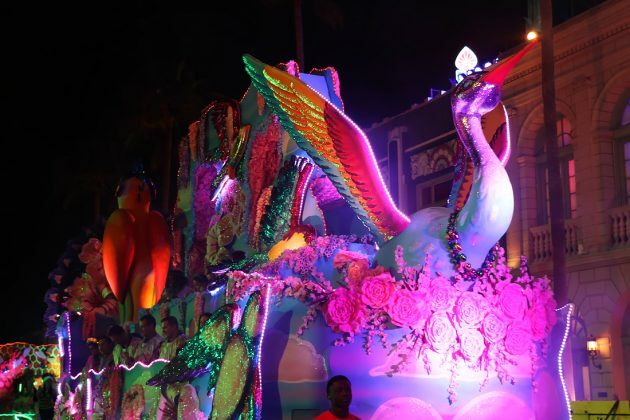 In all seriousness, each float stands out; along with all the fun costumes that have been designed to match their respective theme. 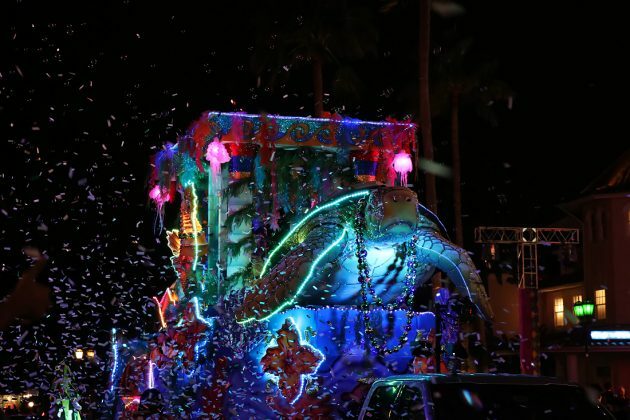 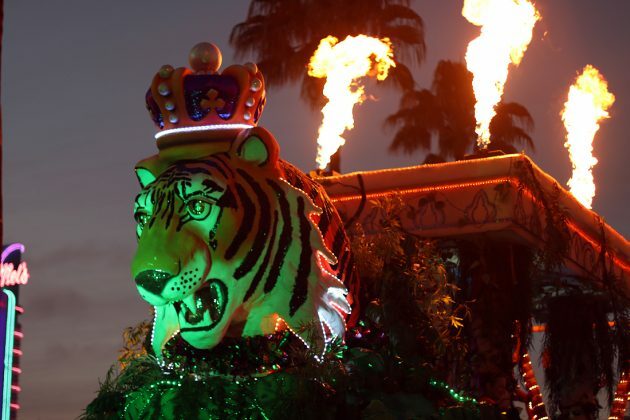 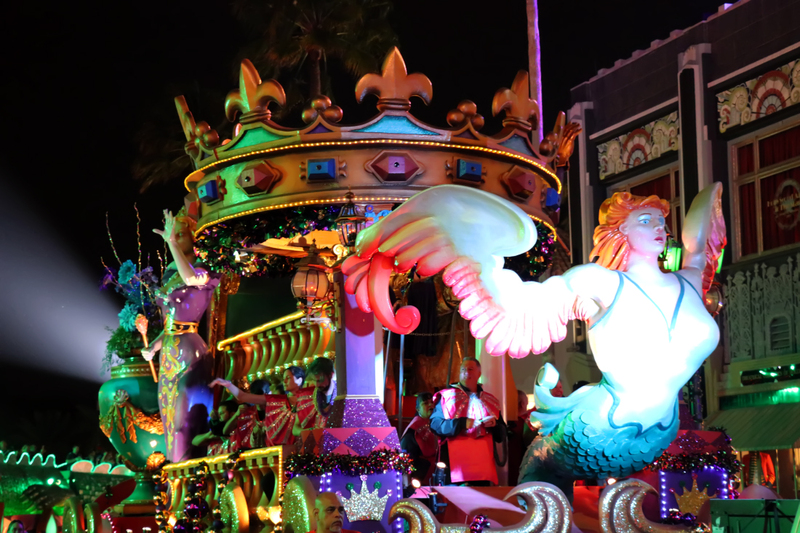 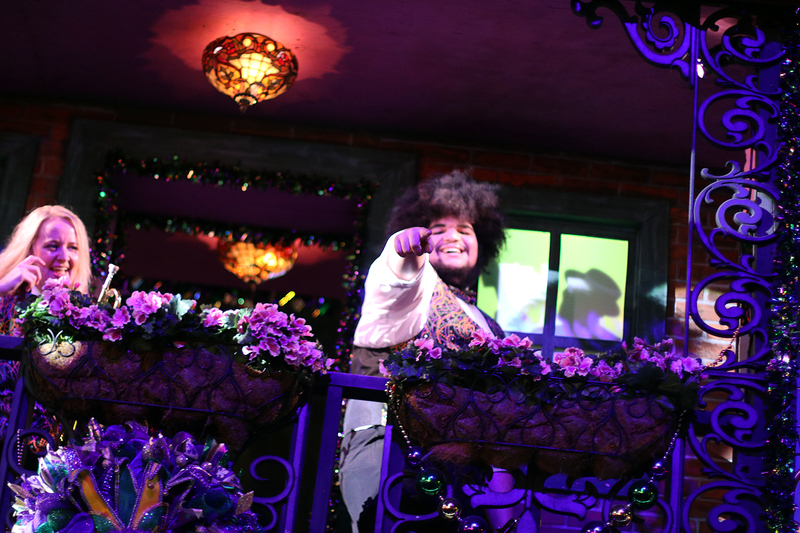 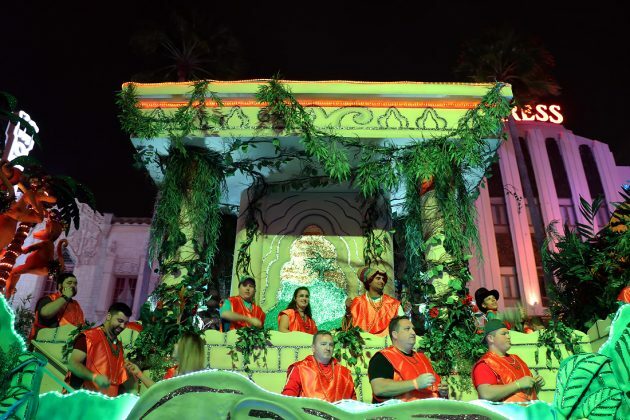 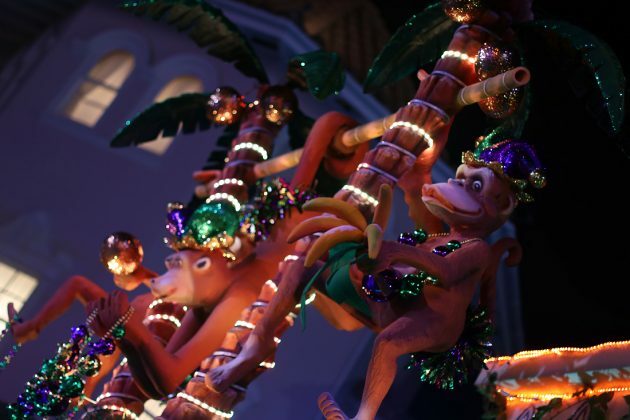 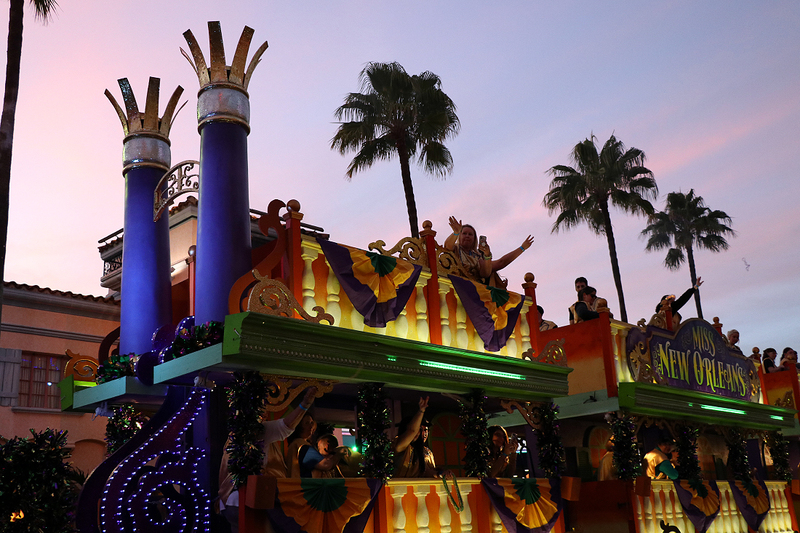 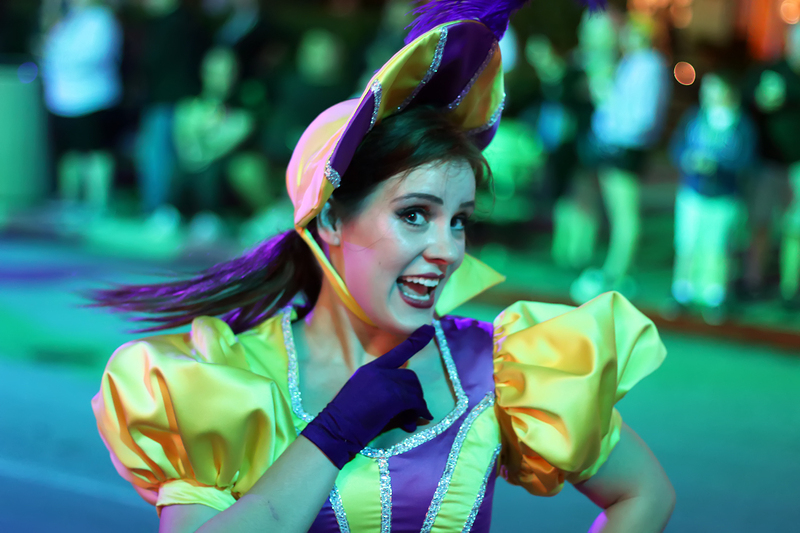 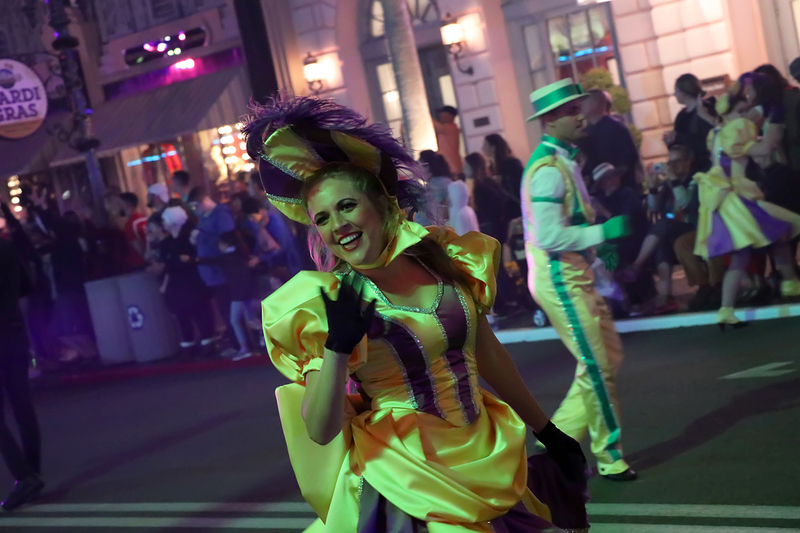 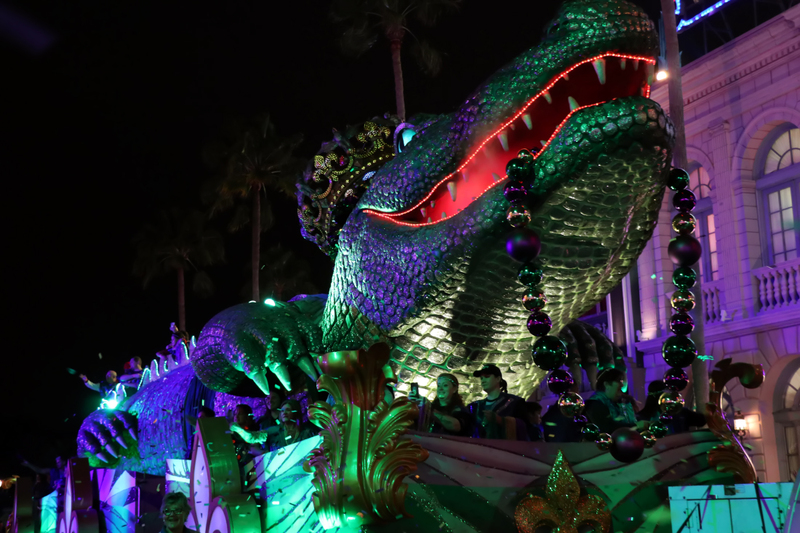 Hands down, the most entertaining thing to do at Mardi Gras – and maybe even Universal Orlando period – is riding a float and taking part in throwing beads to guests. 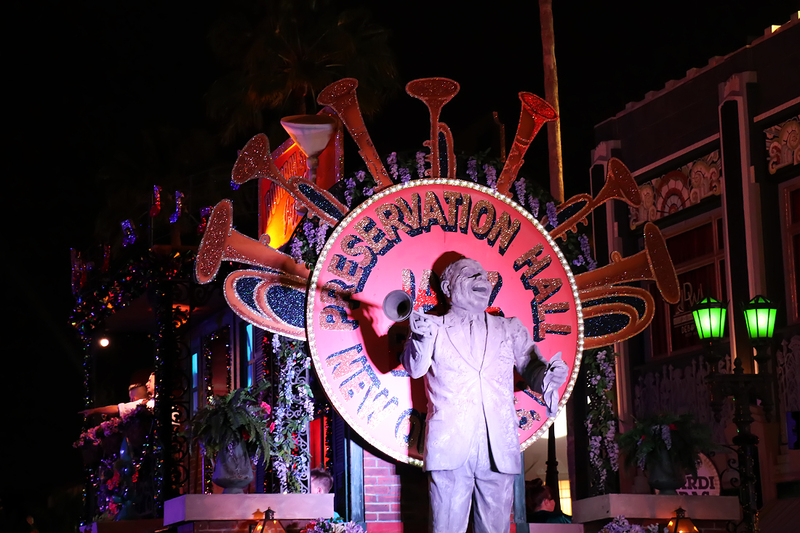 You do have to dedicate some time to wait to ensure a spot, especially during busy nights, but the wait is very well worth it. Seeing guests, especially kids, take joy and ask for beads adds another level of fun to the event. 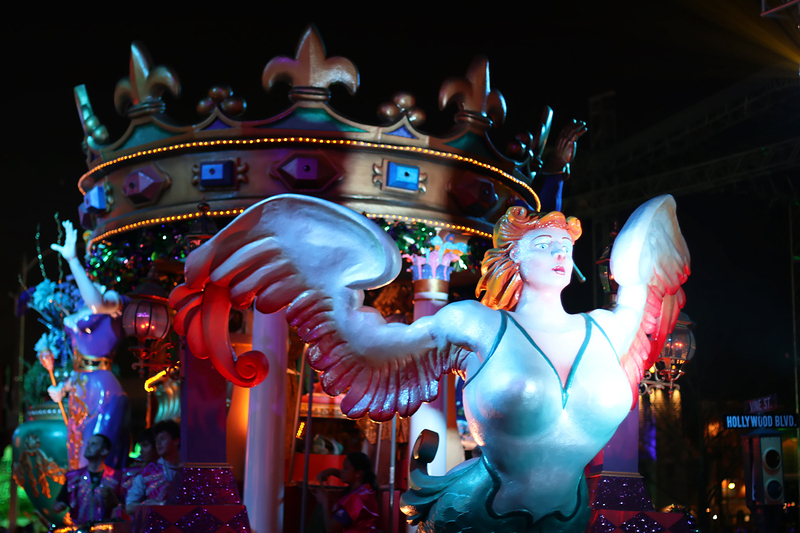 The star of the event is the French Quarter. 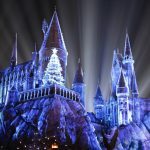 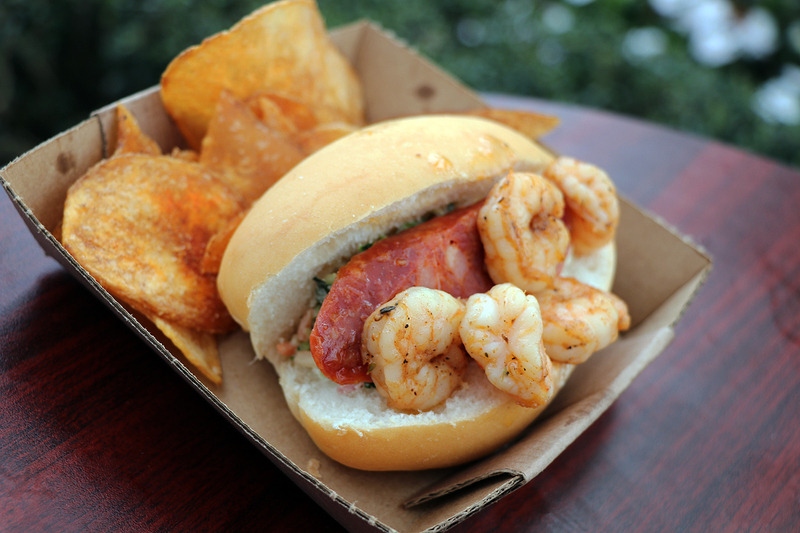 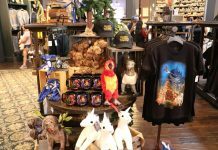 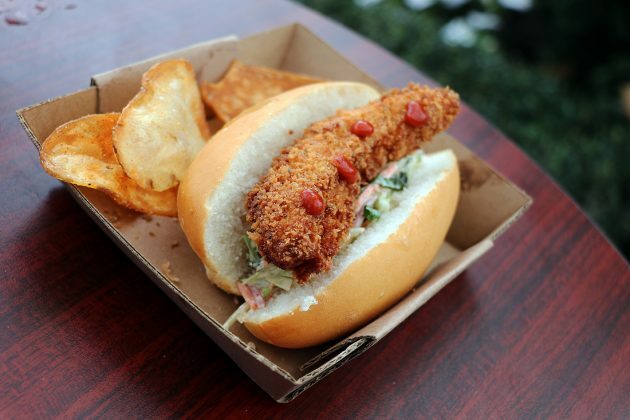 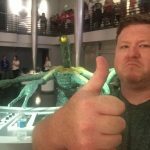 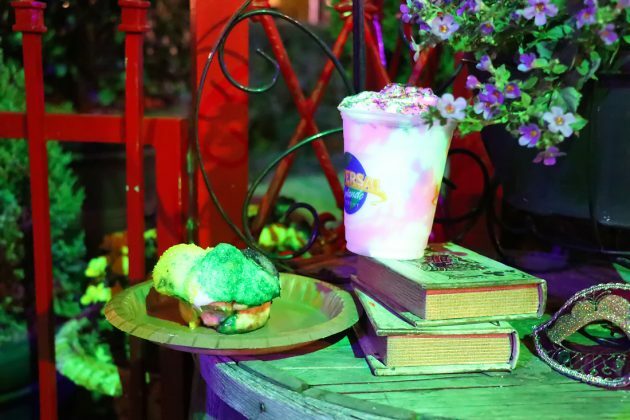 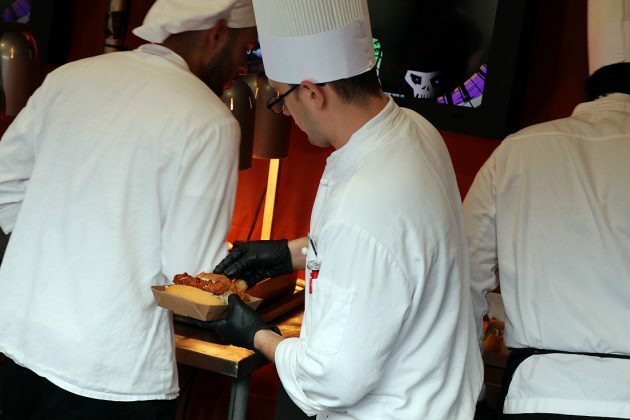 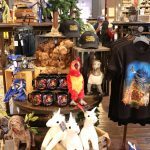 This year, Universal has made an effort to retool their food offerings – in what appears to be the first steps into making the event into their version of “Food & Wine”. 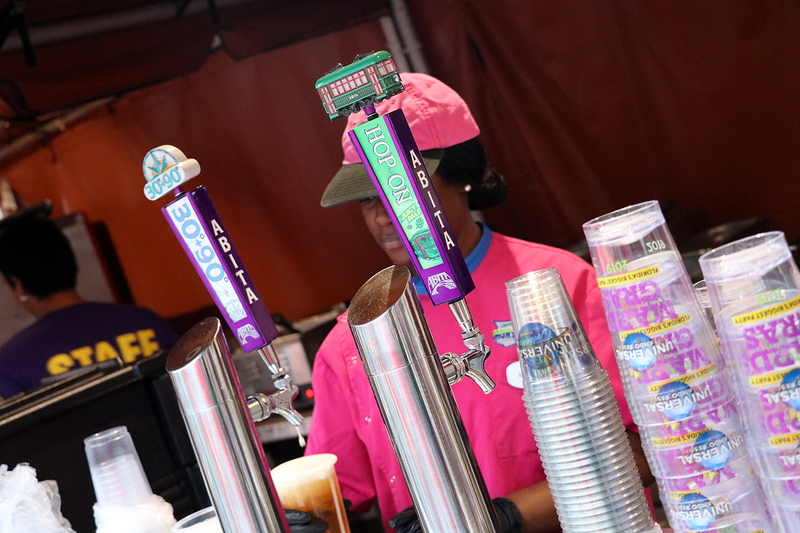 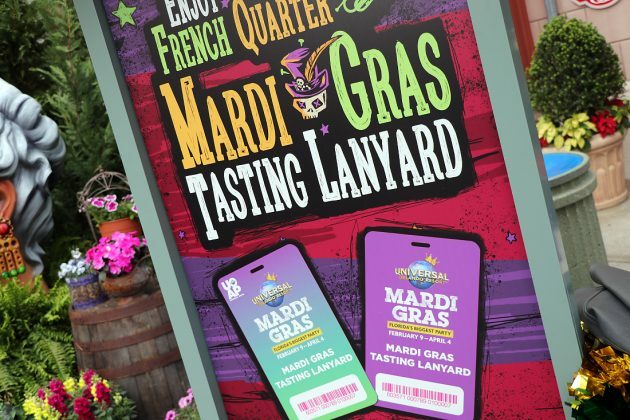 Universal has yet to really feature their own signature “Food & Wine” event, which has been notoriously successful at Epcot at Walt Disney World, SeaWorld with their recent Seven Seas Food Festival, and Busch Gardens with their own Food & Wine Festival. 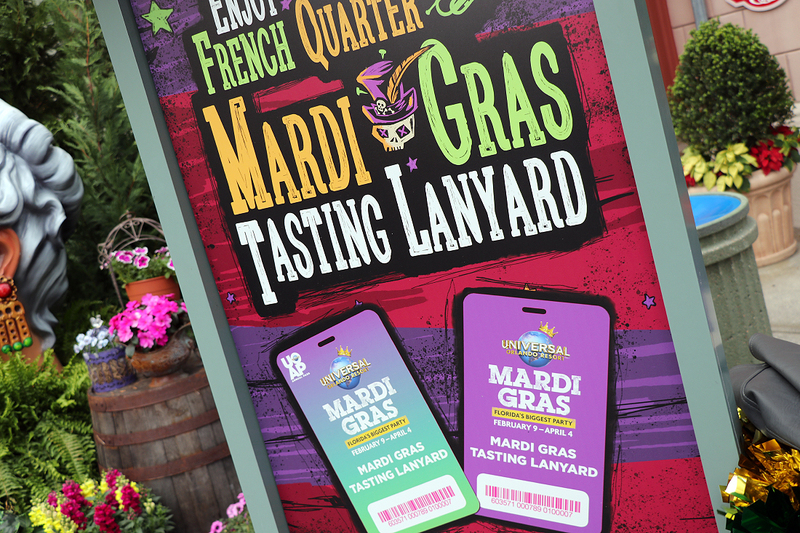 New this year, is the Mardi Gras tasting lanyard, which comes in 3 options: 5 items lanyard for $30, 10 items lanyard for $50, and the passholder exclusive 15 items lanyard for $60. 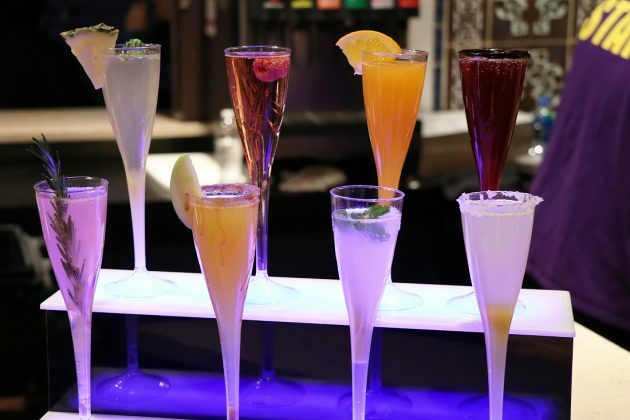 The best part is alcohol in included, served in a 9oz glass. 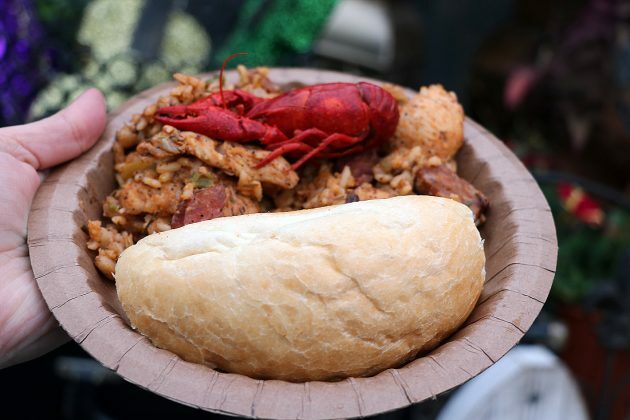 Traditional jambalaya, served with crawfish and a roll. 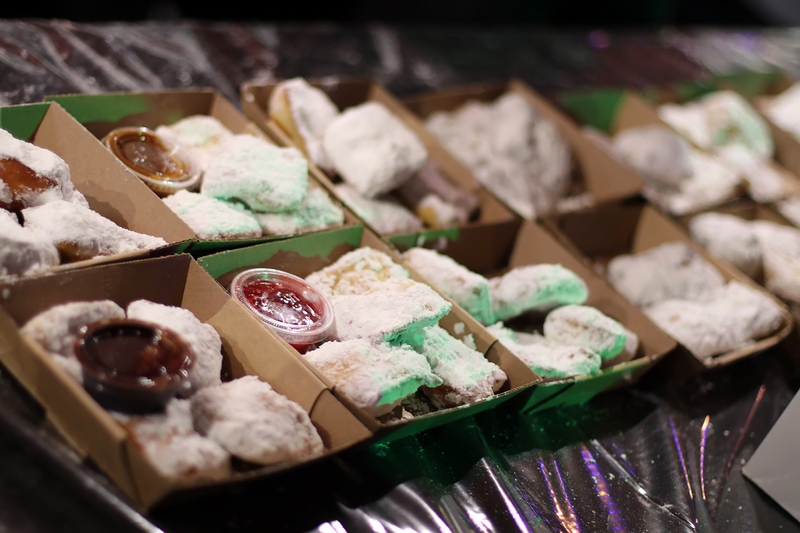 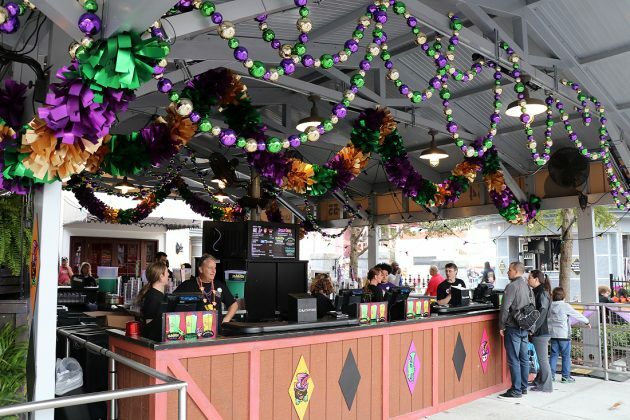 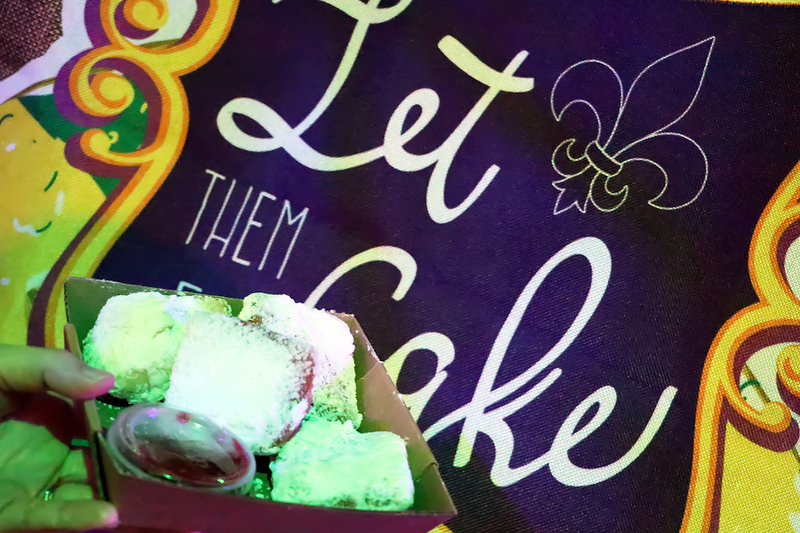 The menu at Mardi Gras has also changed a bit, with all the offerings now Cajun-inspired – meaning no more chicken fingers and cheesesteaks. 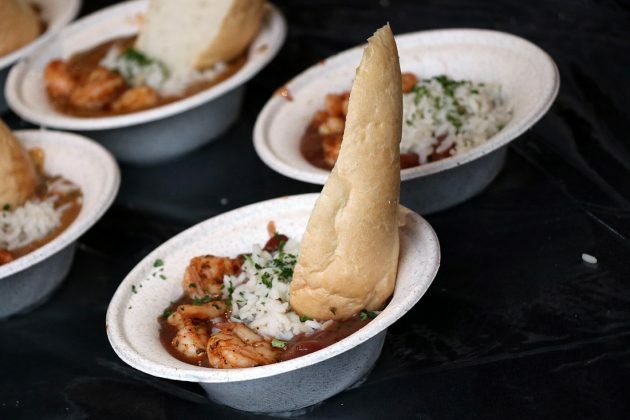 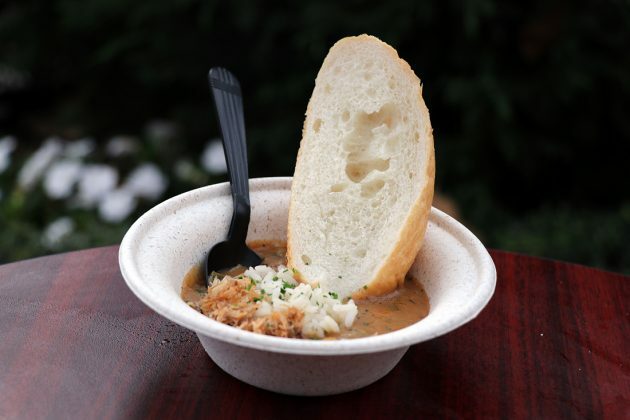 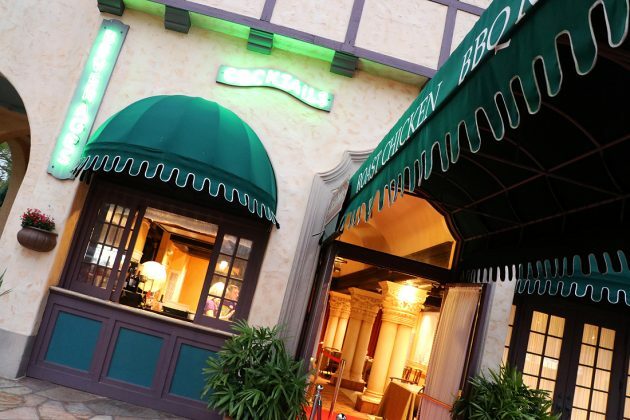 Everything from gumbo to etouffee, and jambalaya to gator bites is available for you to taste. 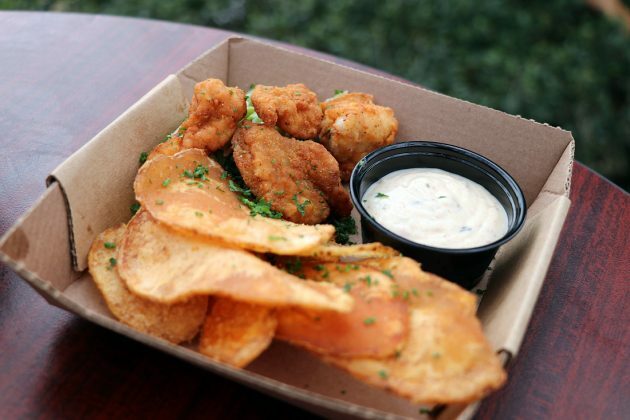 Quite honestly, we weren’t disappointed with any of the dishes – including the gator bites. 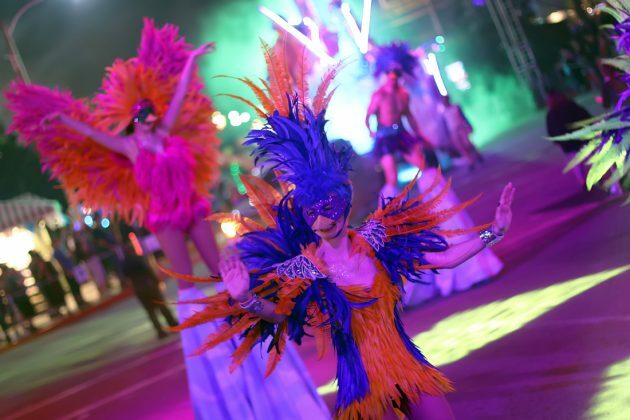 The true highlight of the event though are the performers. 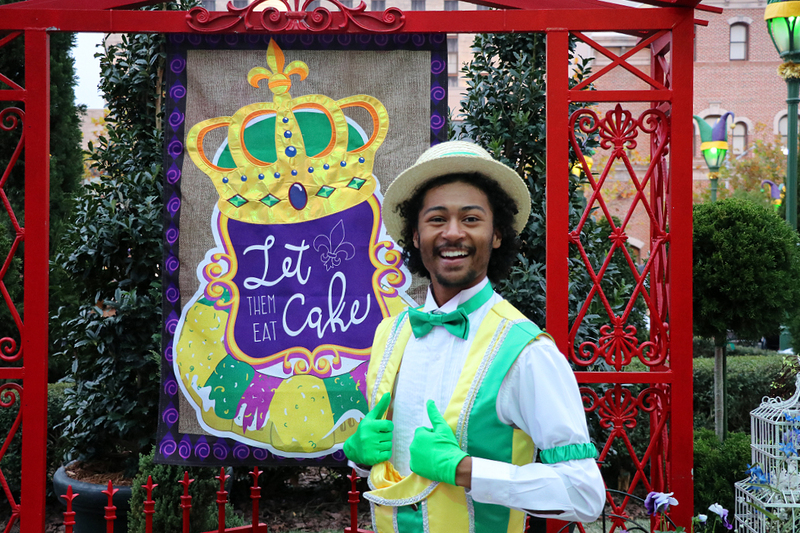 Their interactions with everyone in the French Quarter Courtyard brings a personal feel to the event, especially when it’s with kids. 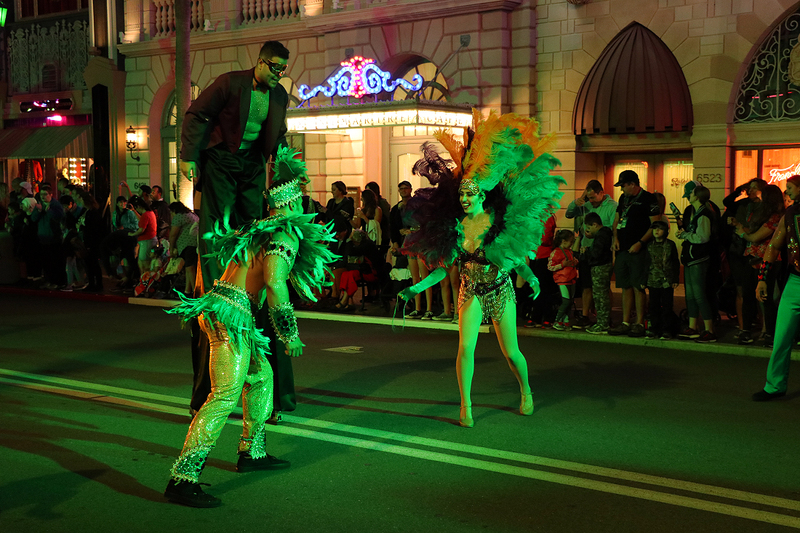 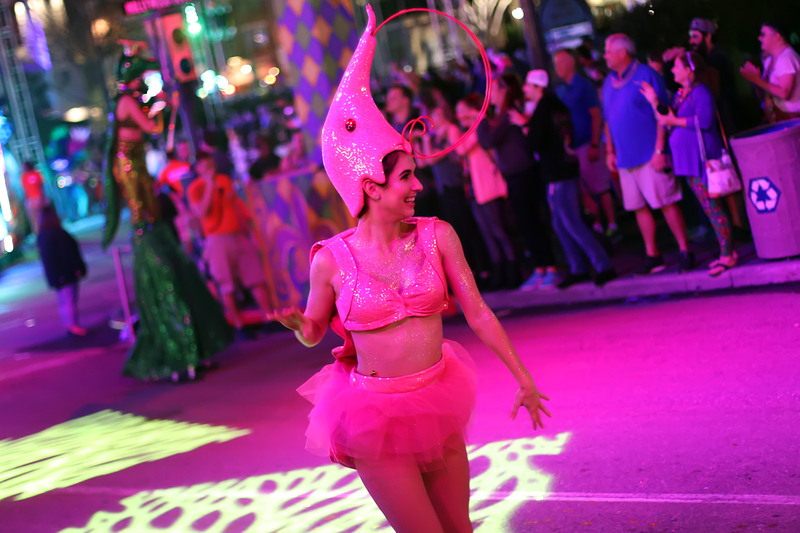 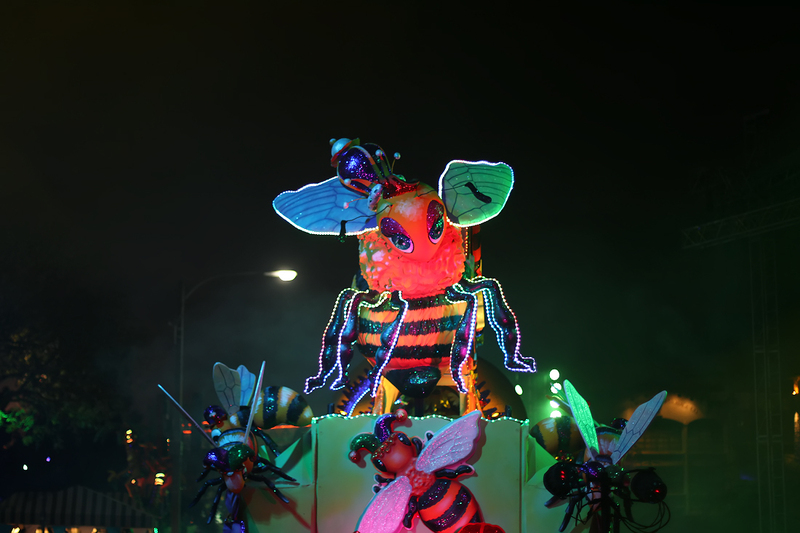 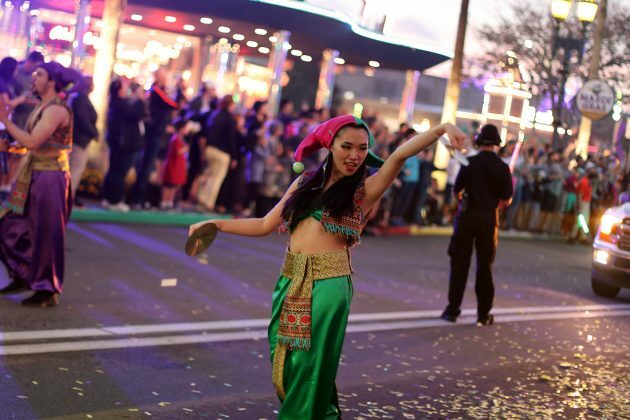 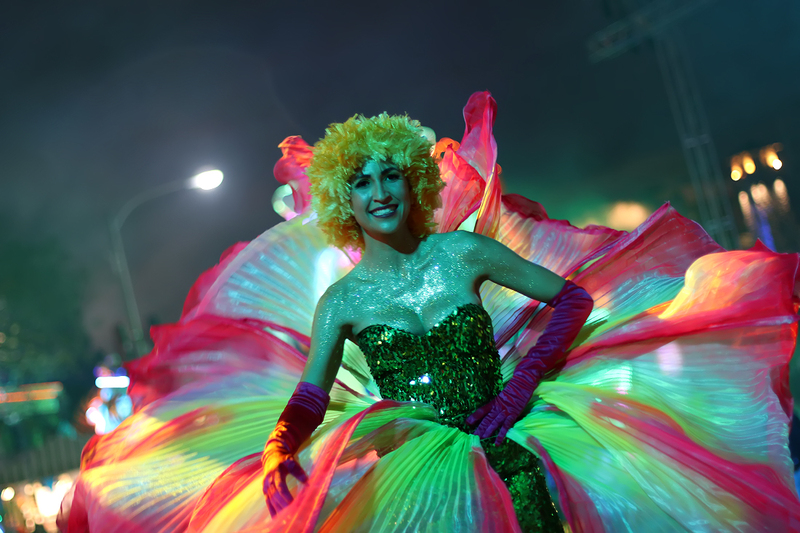 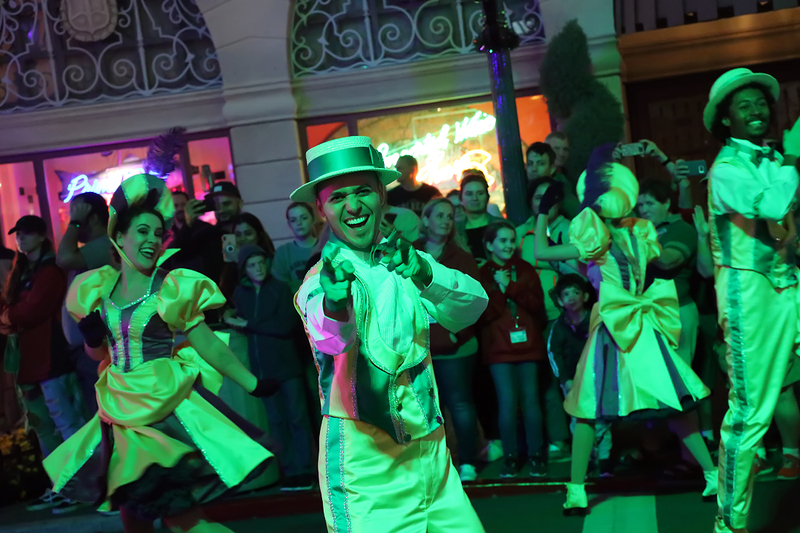 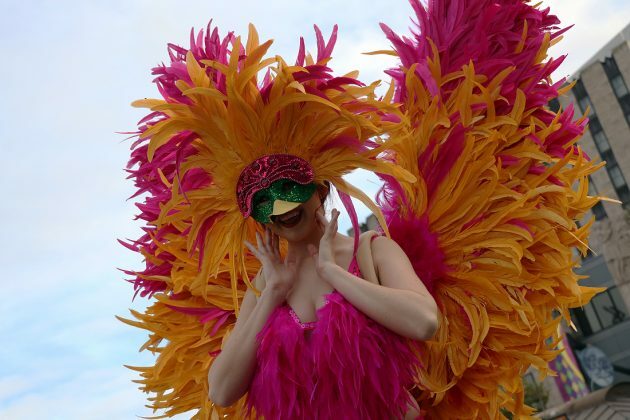 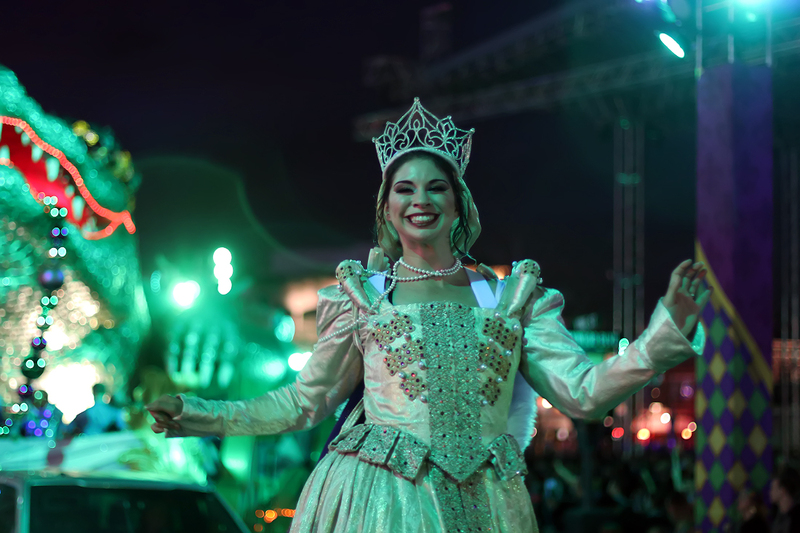 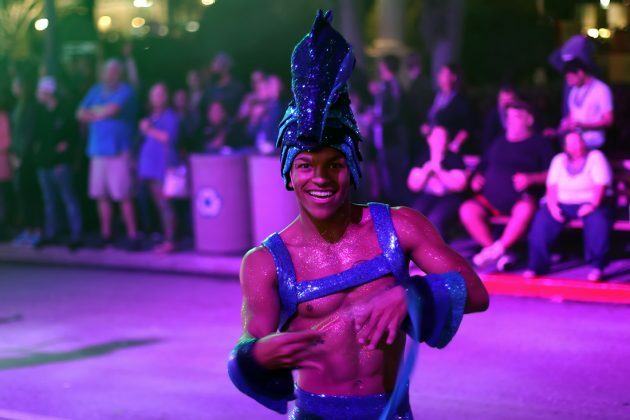 Each night, these performers give it their all with a smile on their face, making sure your visit will be a memorable one – especially come parade time. 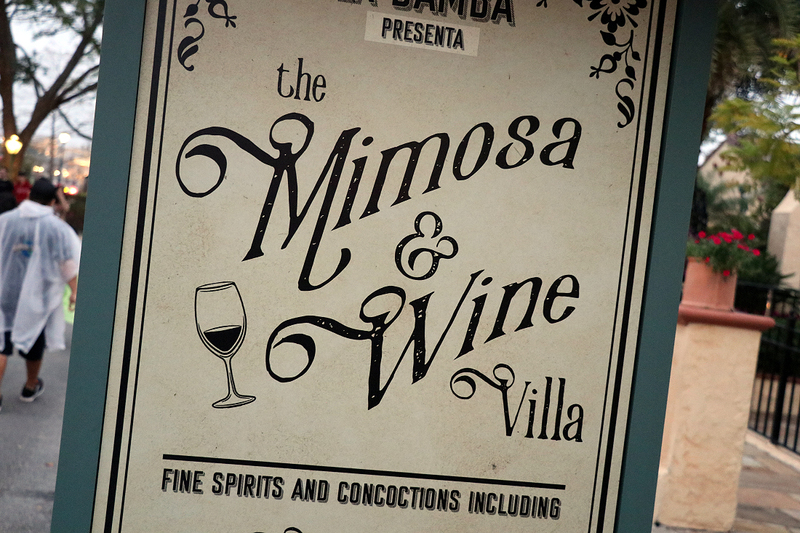 Another thumbs up goes to the new Mimosa Bar, which offers 8 different flavors to enjoy for just $10.99+ tax. Located at Café La Bamba in Hollywood, the bar is a nice place to sit and relax away from all the commotion. 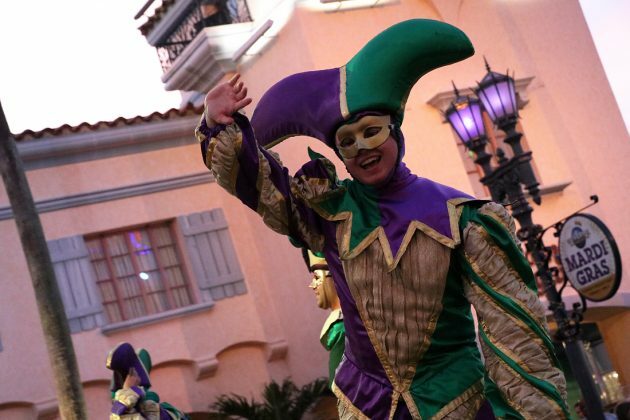 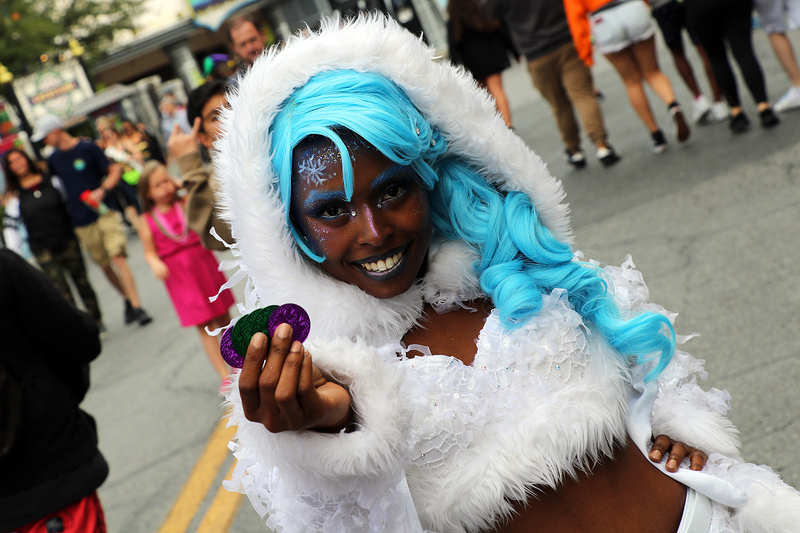 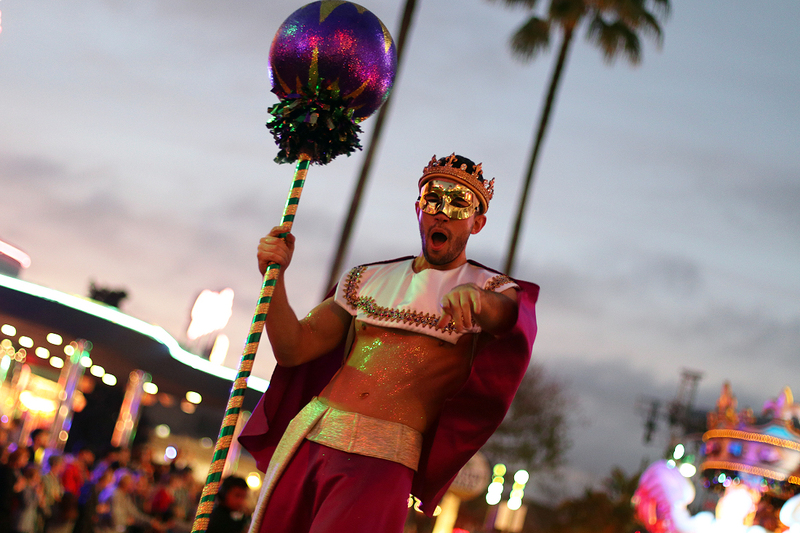 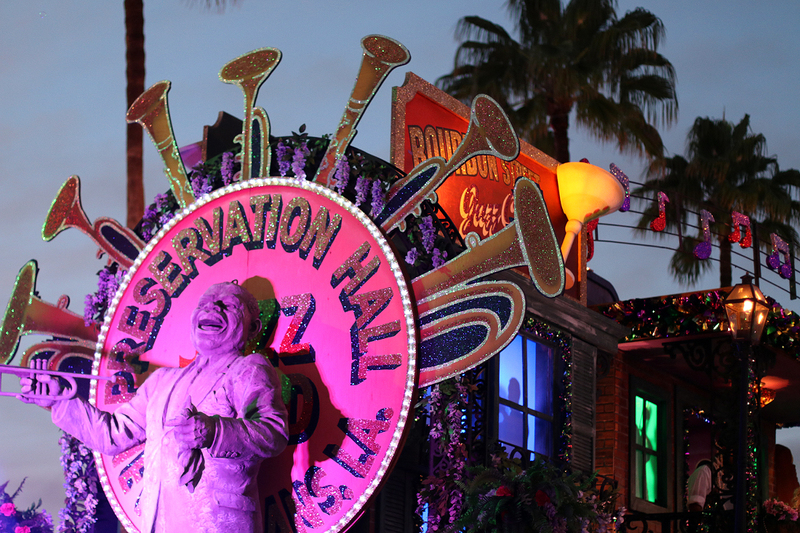 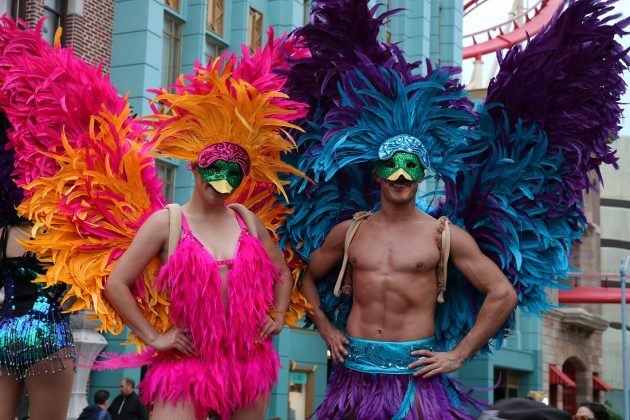 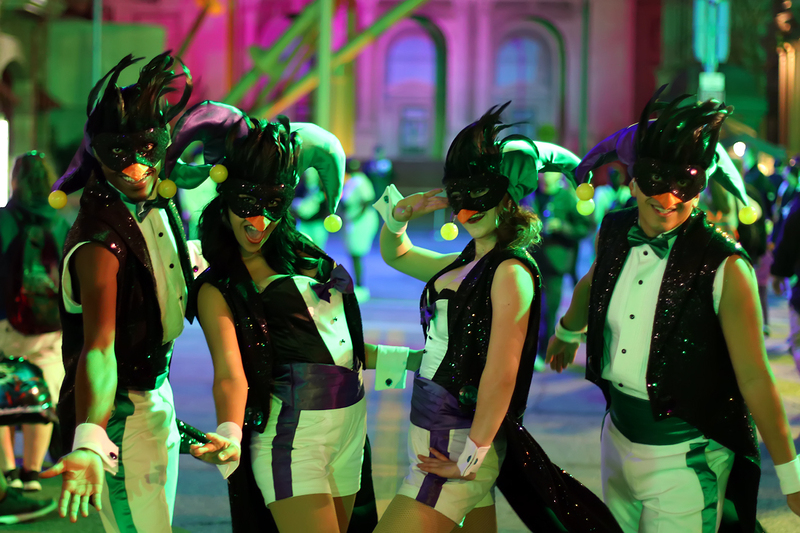 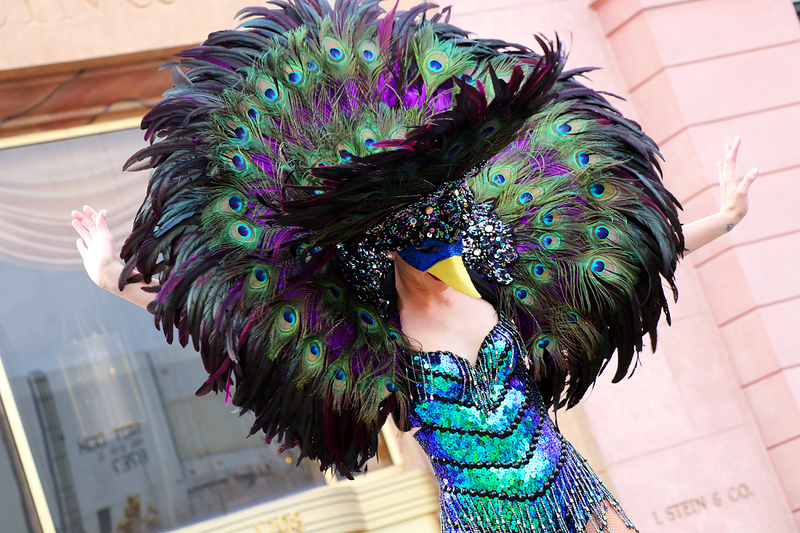 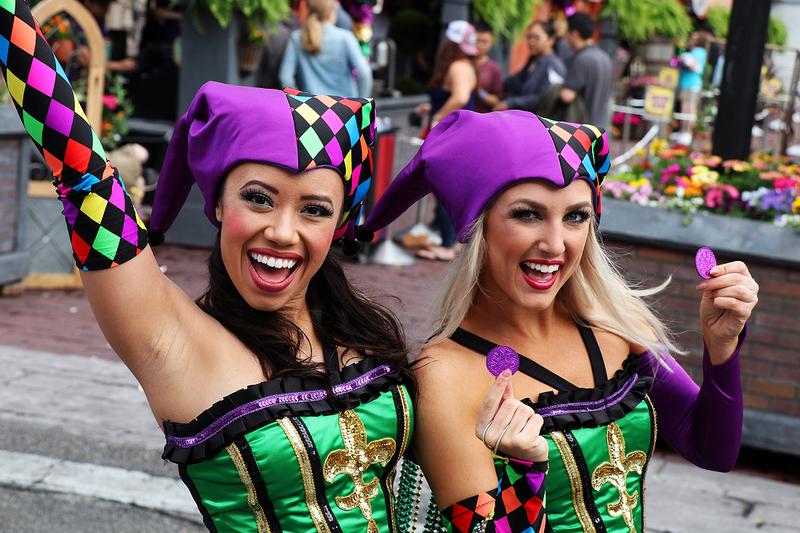 As we’ve stated time and time again, Universal’s Mardi Gras is a must-do. 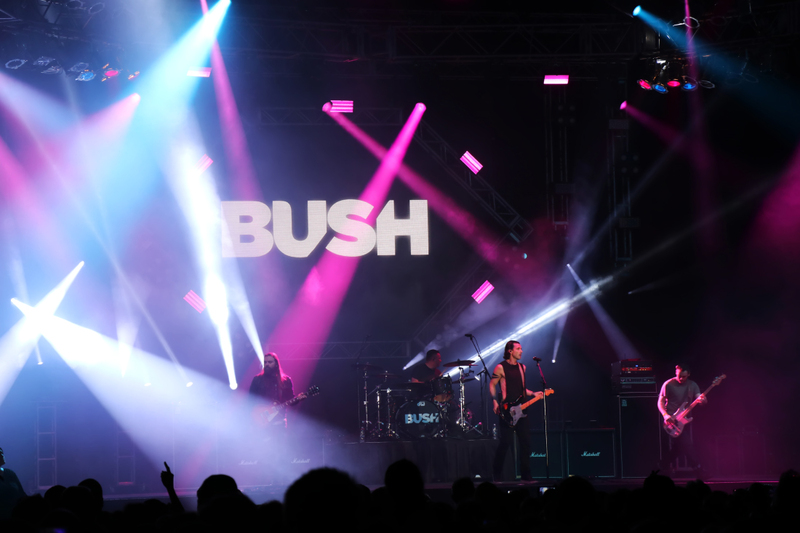 If you can’t visit this year, make sure to set some time for next year to come – as we’re sure the event will continue to get bigger and better. 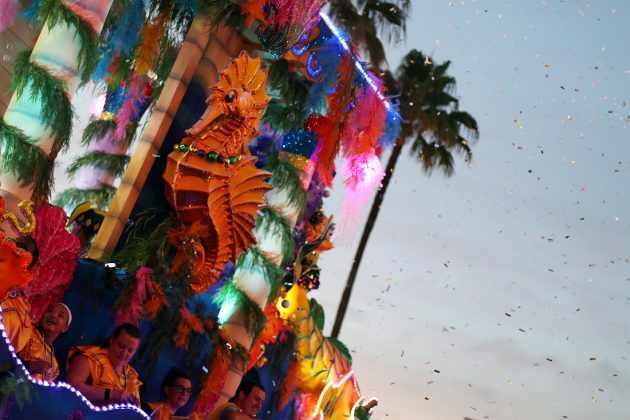 If you’re planning on heading out this year, we’ve prepared a guide that offers some tips and planning advice. 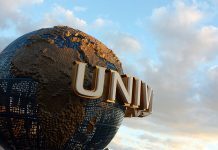 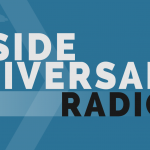 Stay tuned to Inside Universal for more on Universal Parks & Resorts.